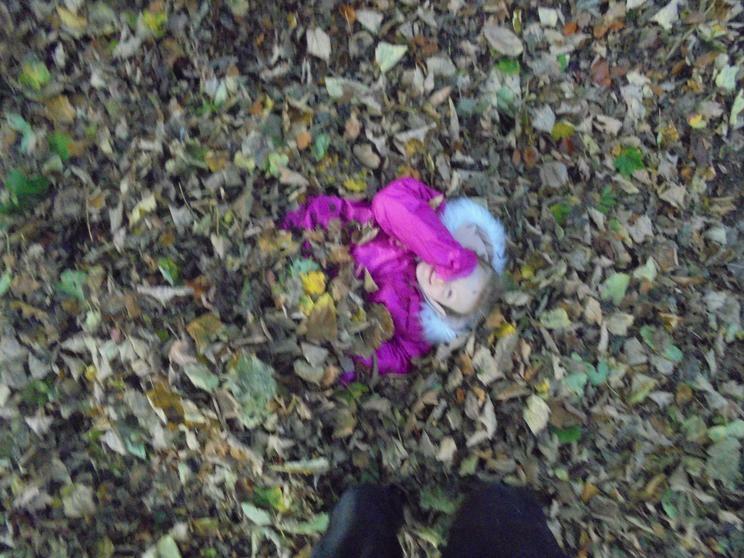 It always amazes me how children's imagination can take off over what I might discount as a piece of rubbish. 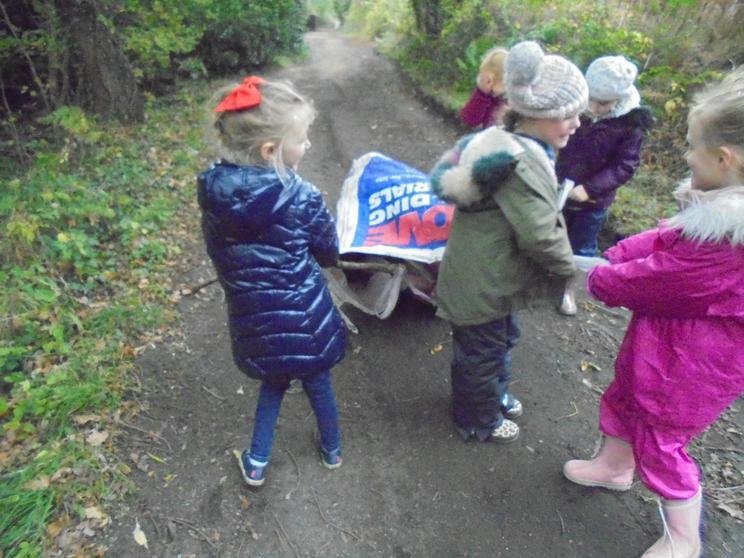 Today whilst walking along to our centre we found an old 'dumpy' bag, the sort that builders have materials delivered in. 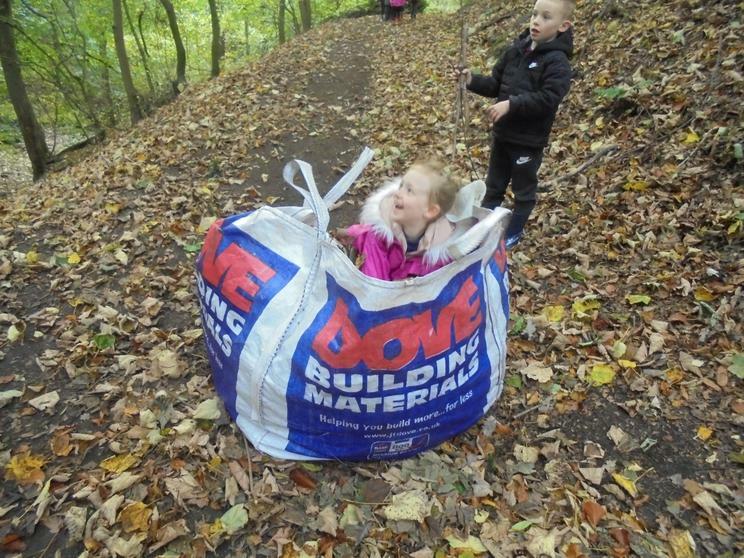 Straight away the bag became a stretcher. 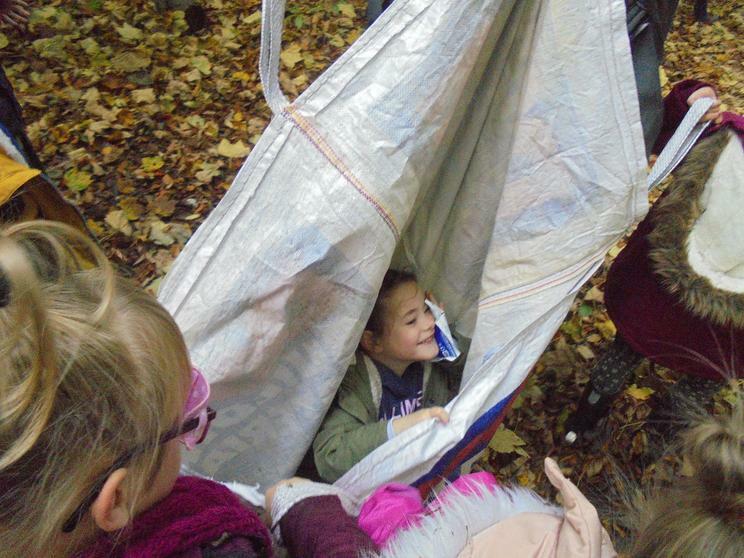 The children took it in turns to pull each other along inside the bag. 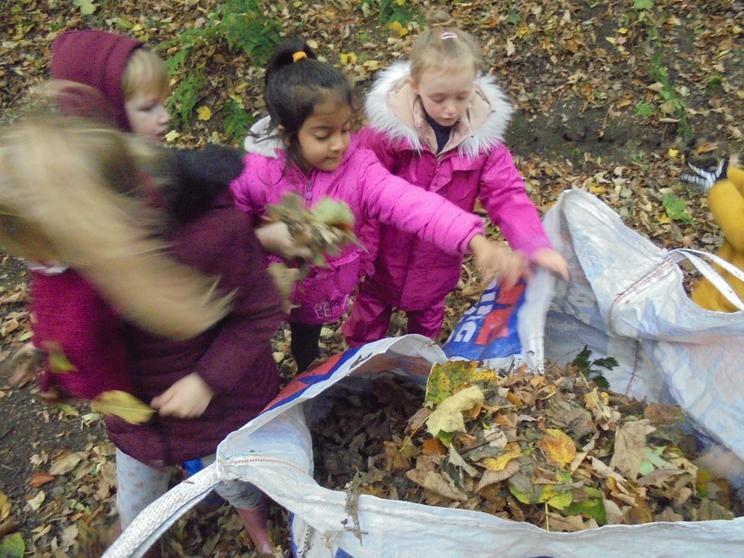 Next it became a leaf collector, everyone worked together to fill the bag up to the top. 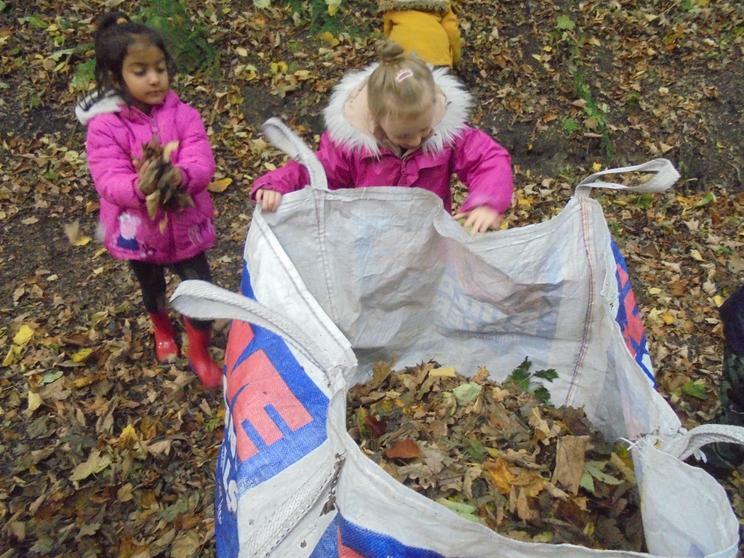 What would you do with a bag full of leaves? 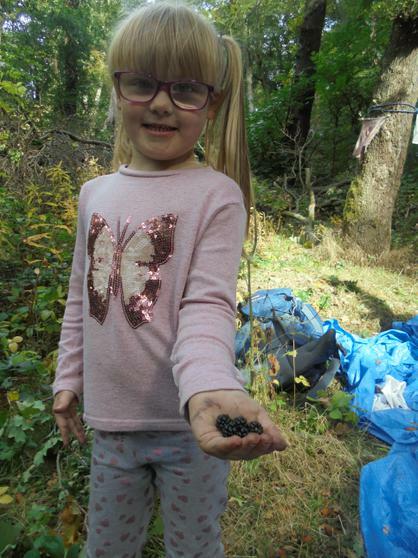 Jump in them! 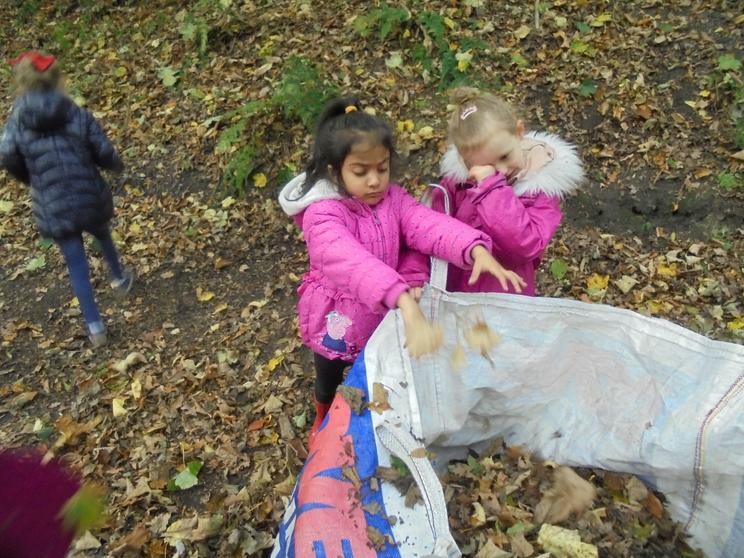 Some of the children were doing such huge jumps that the bag tipped over. 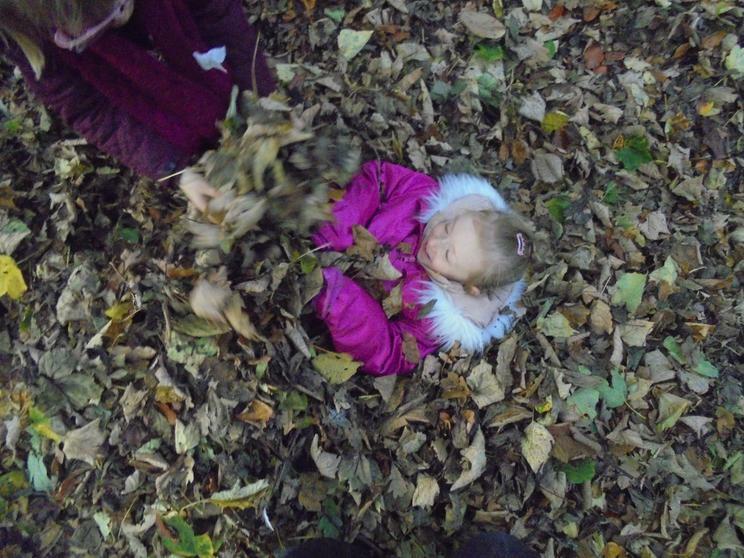 We decided it would be much safer to empty the leaves out to jump in them. 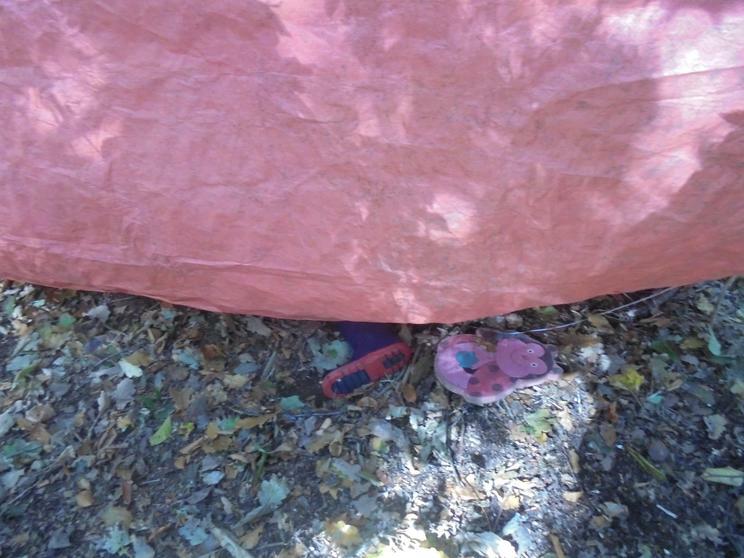 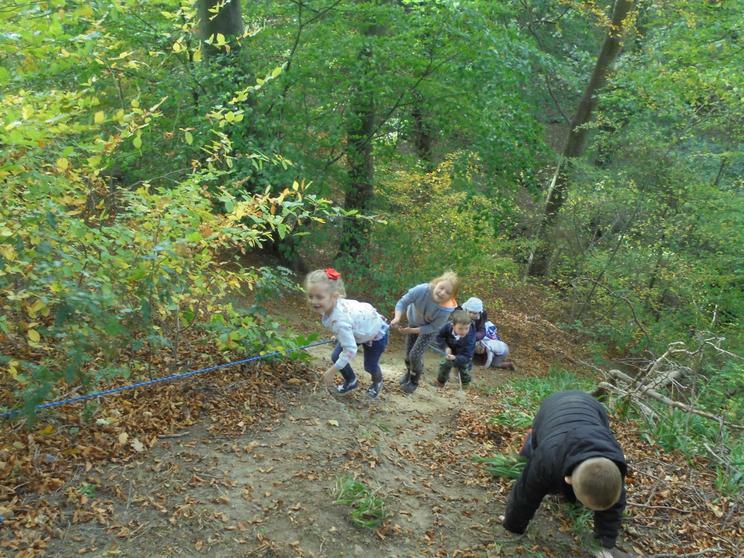 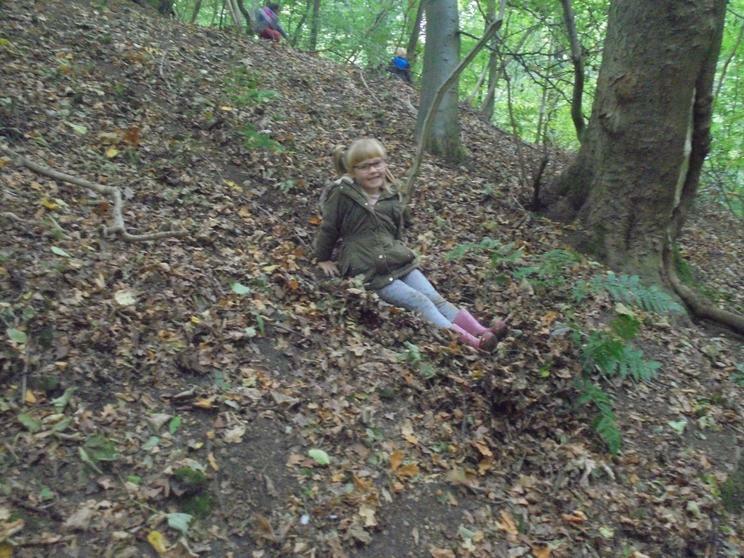 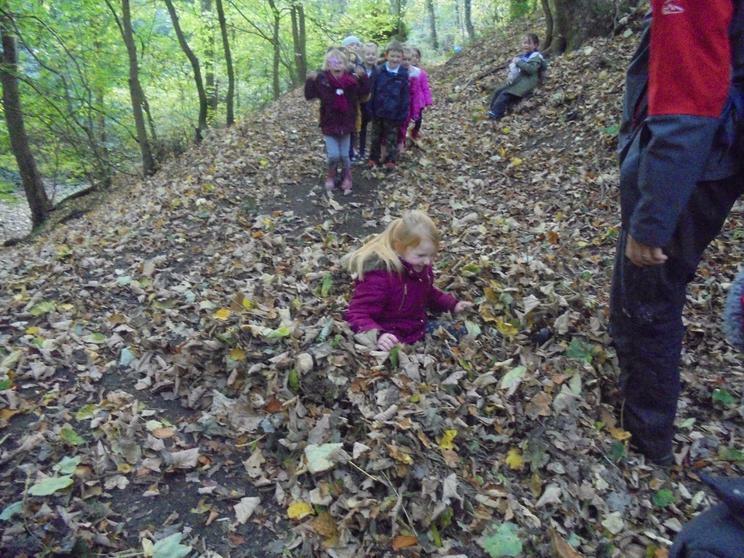 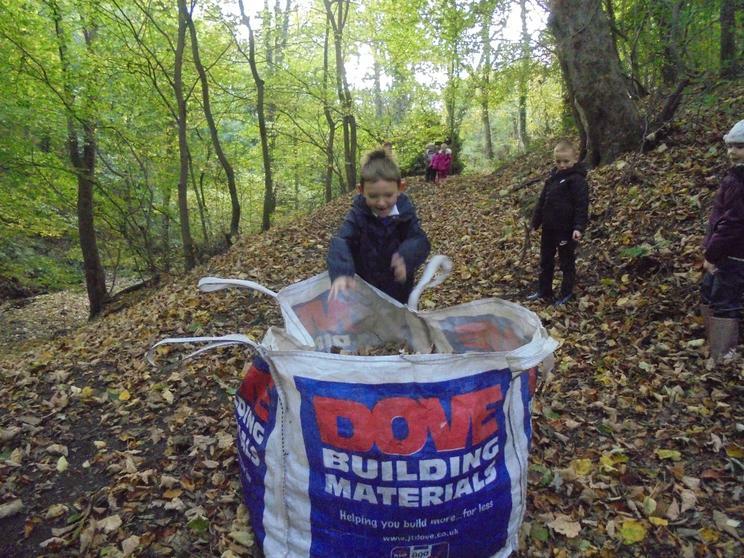 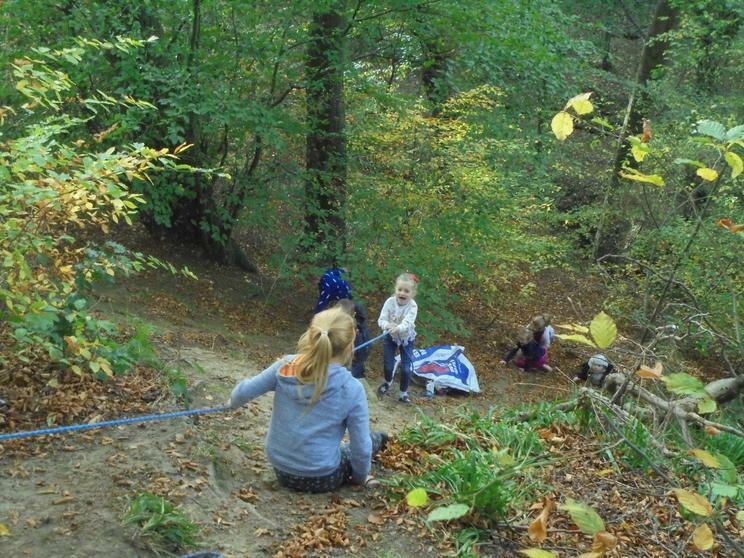 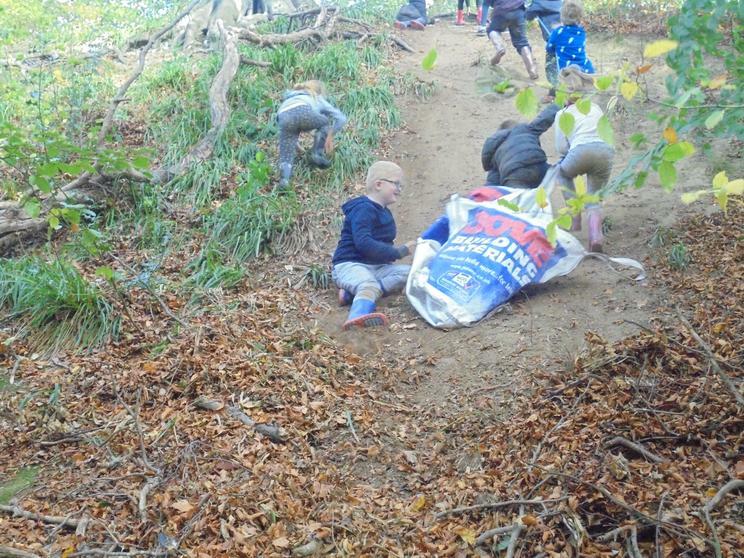 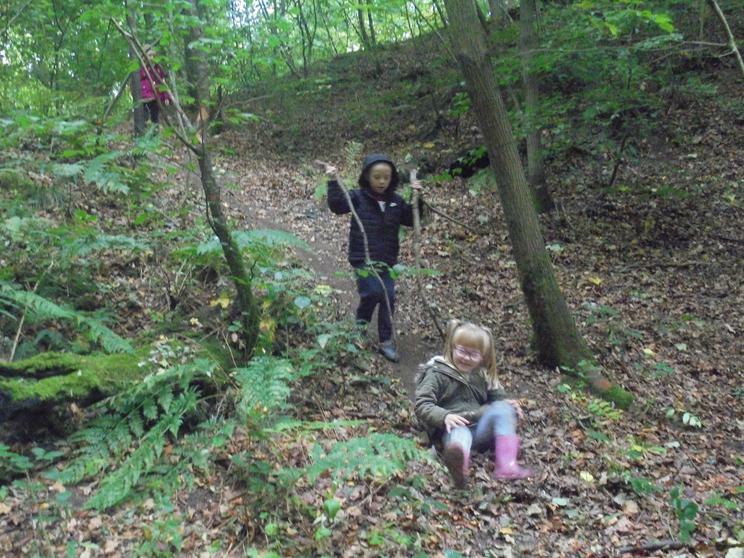 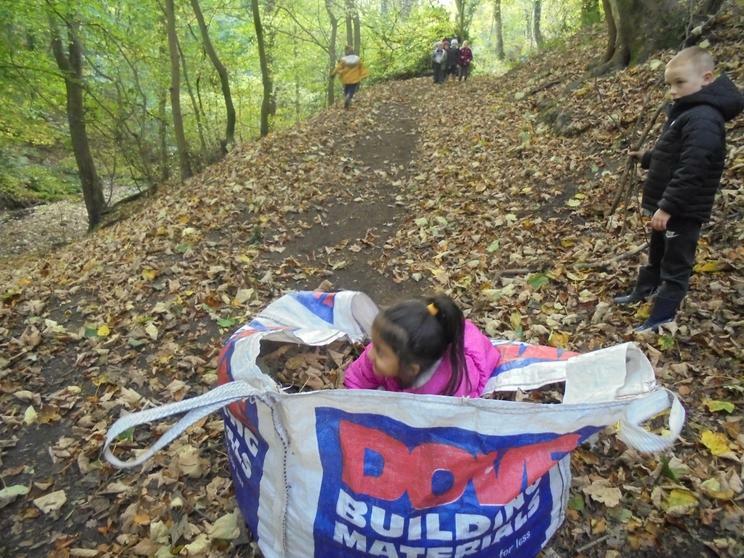 When we got to the dene we then used the bag as a slide down a slope. 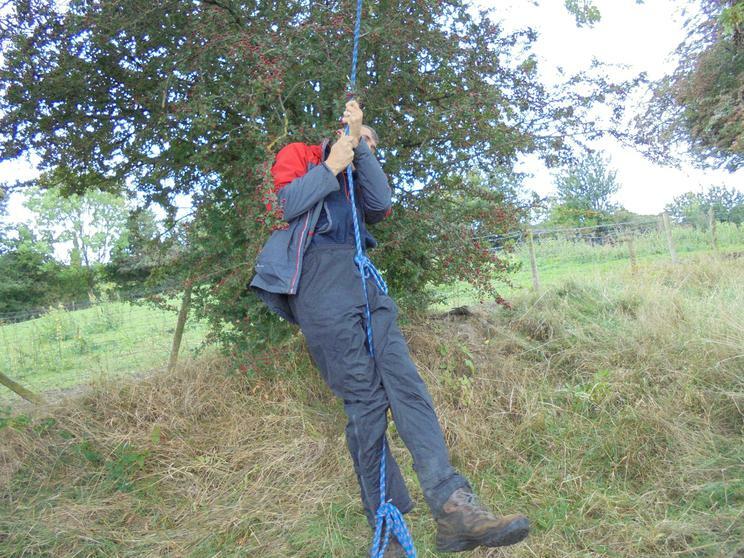 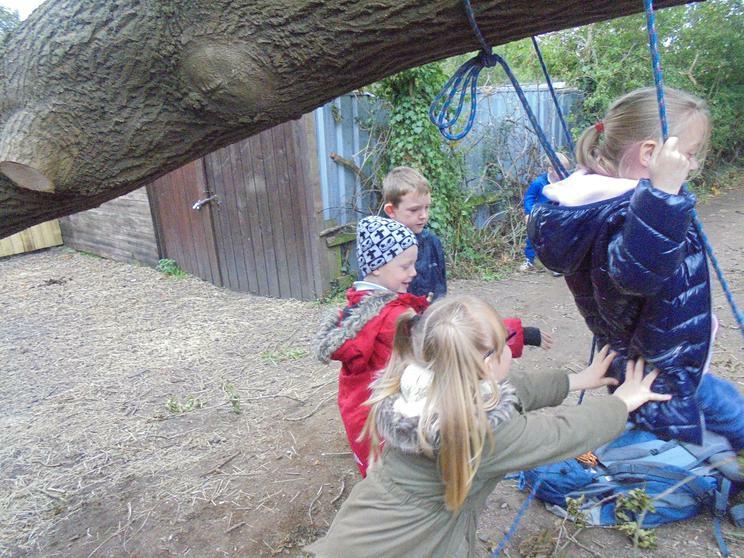 The rope then became the adventure so that was tied to a tree and most of the rest of the session was spent climbing up and down the rope. 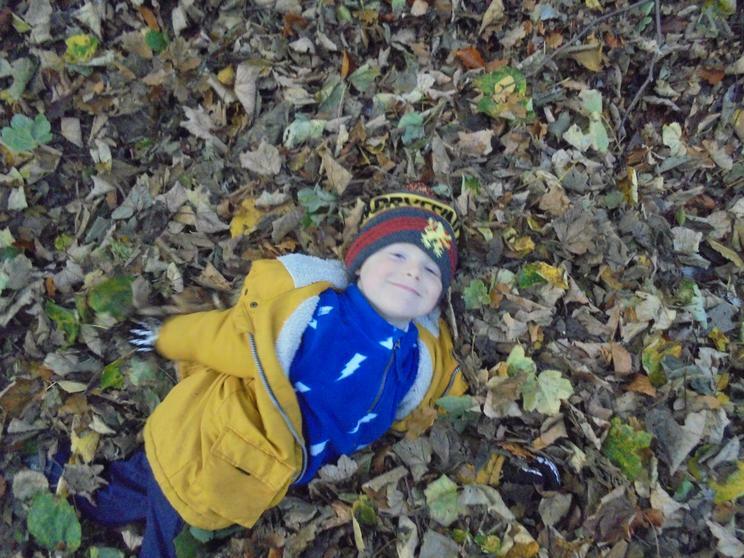 As the leaves begin to fall I am always looking for Autumn things to do. 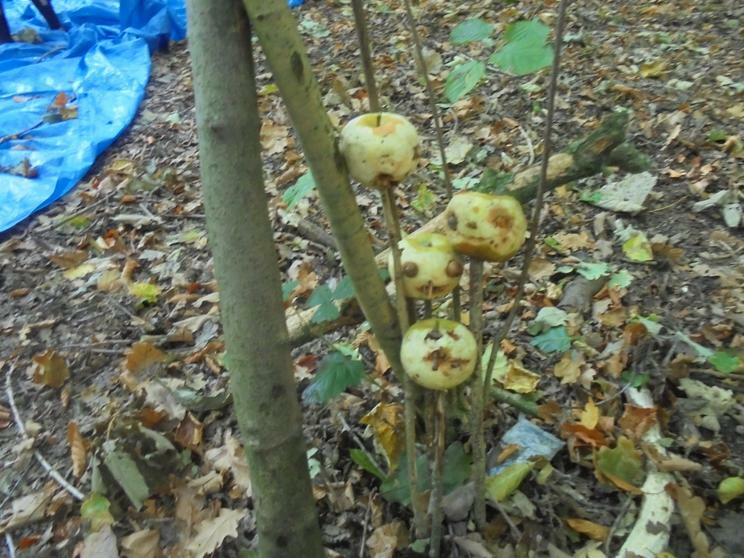 This year I have had a bumper crop of apples so brought some in. 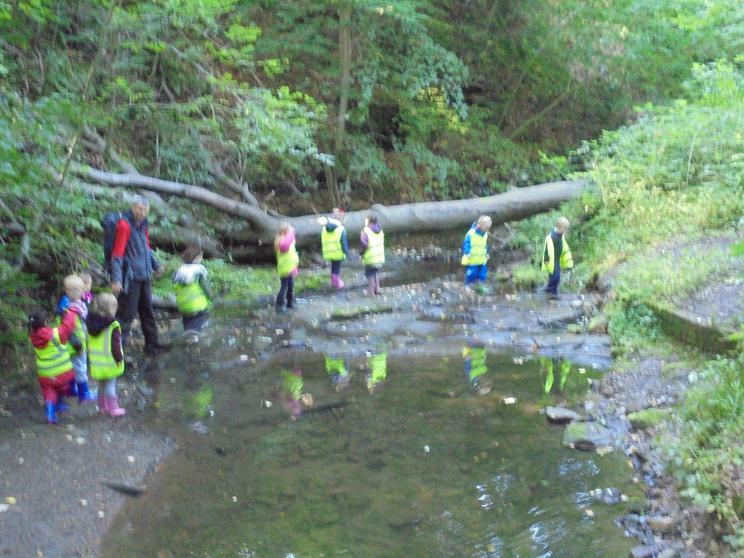 After our walk and explore to the centre of the dene we looked at the things that we could do today. 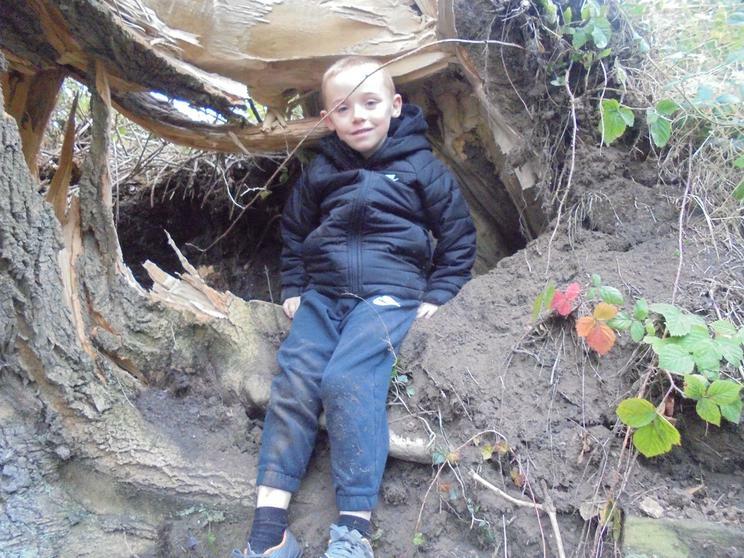 Jackson reminded me that he wanted to make a den so he was happy doing that. 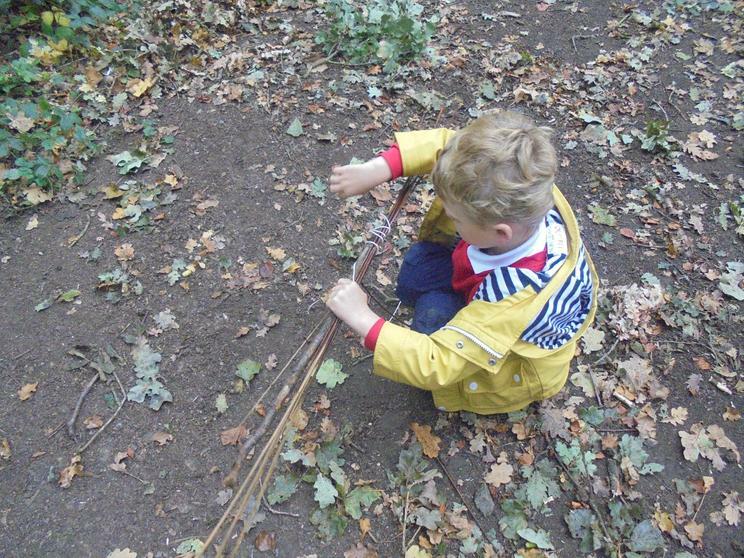 He had some helpers this week so had made some very sharp pegs in no time. 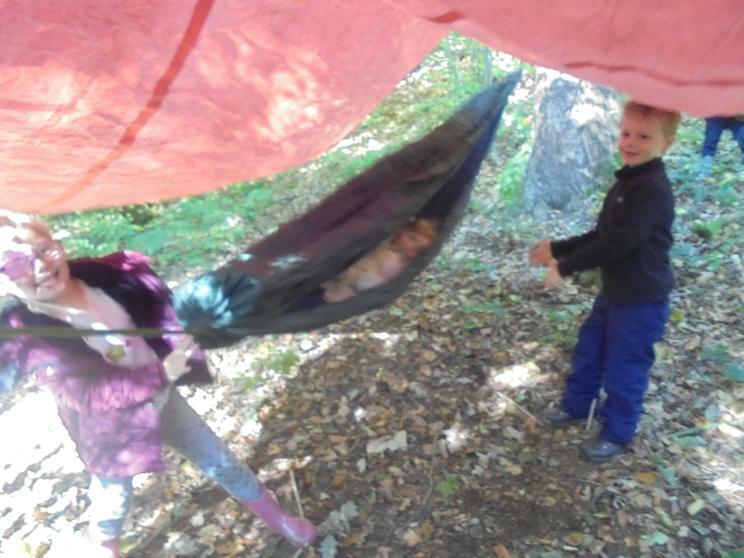 After all the work he need a place to rest so we put a hammock up in his den. 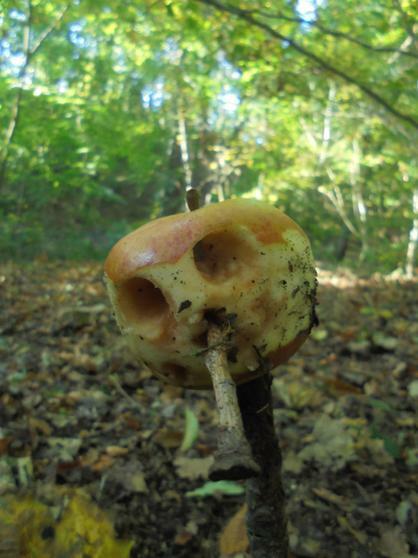 I think it looks good enough for a cam out. 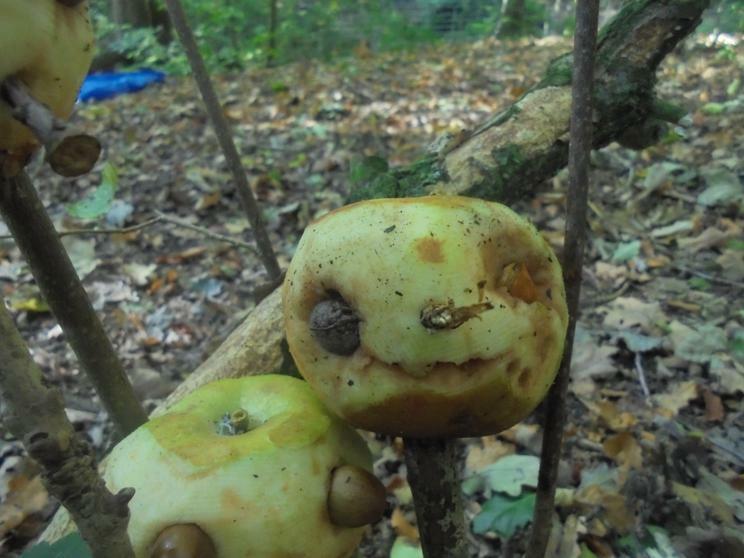 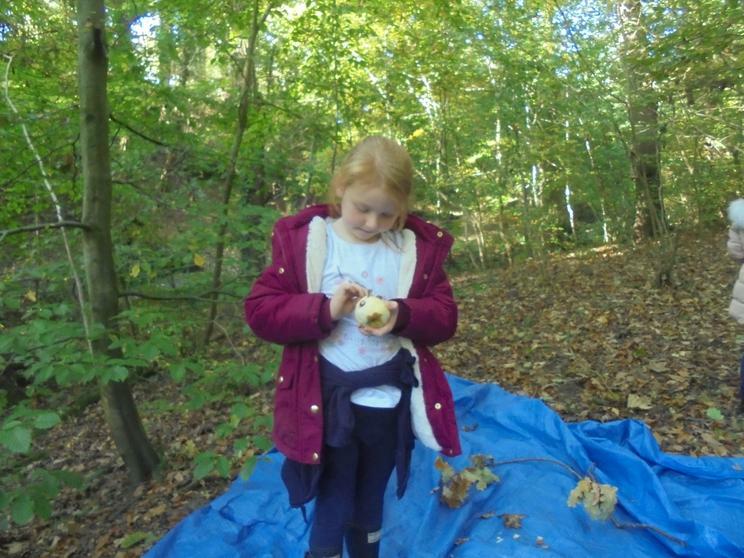 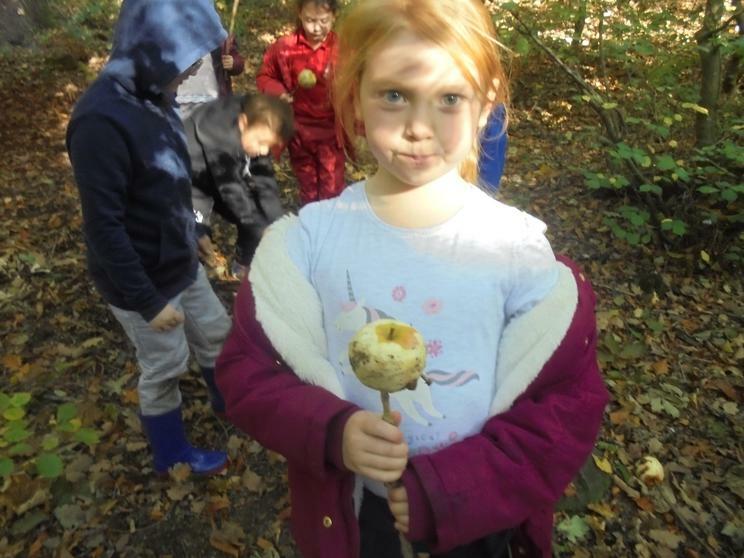 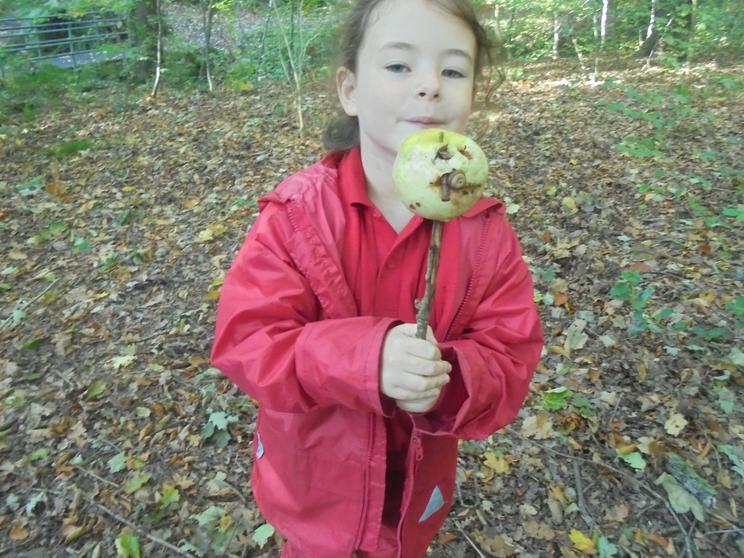 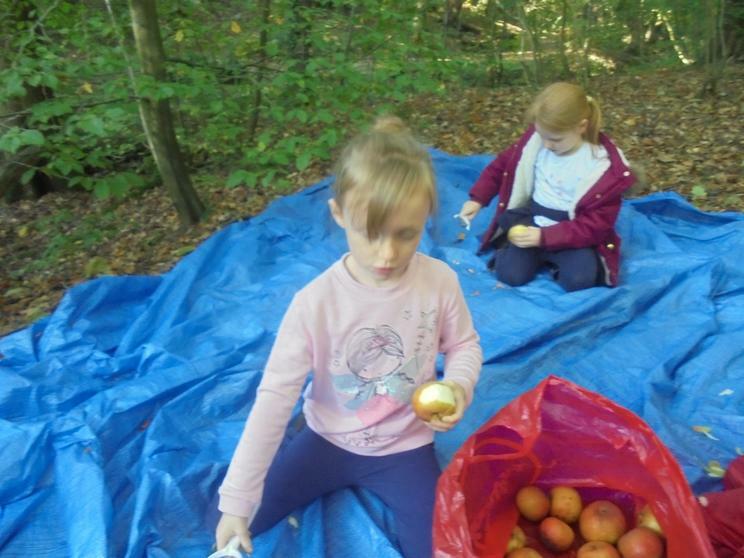 Others wanted to have a go at the apple carving, they had to choose which type of carver they wanted, then find berries and sticks to decorate them. 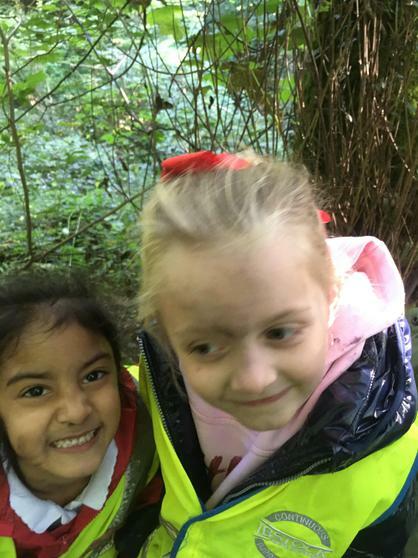 We have put them on the heater in Mrs. Howse room and over the next two weeks they will shrink into ghastly skulls, just in time for Halloween. 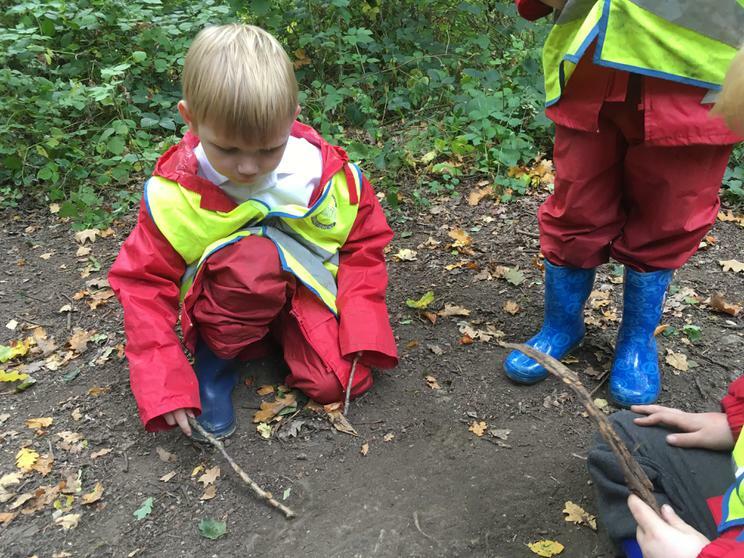 Hayden and Fraser wanted to drill holes for insects to hibernate in, so they found some dead wood and made some great holes in them. 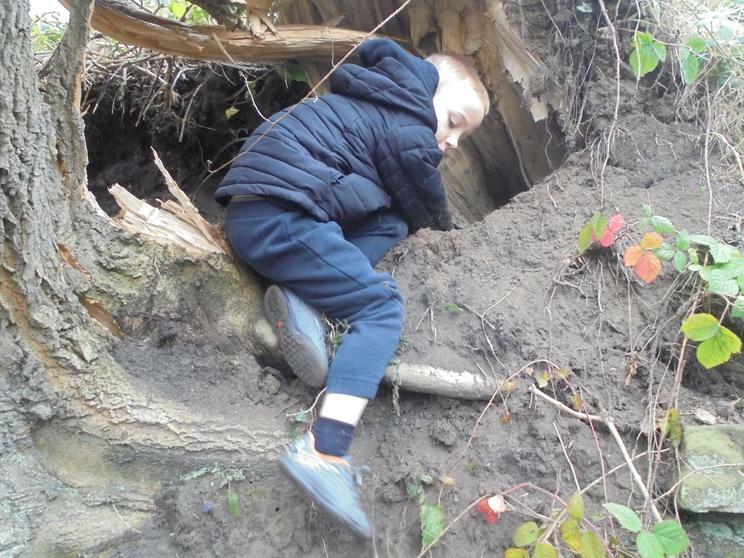 One of the holes we used to help peg out Jackson's den. 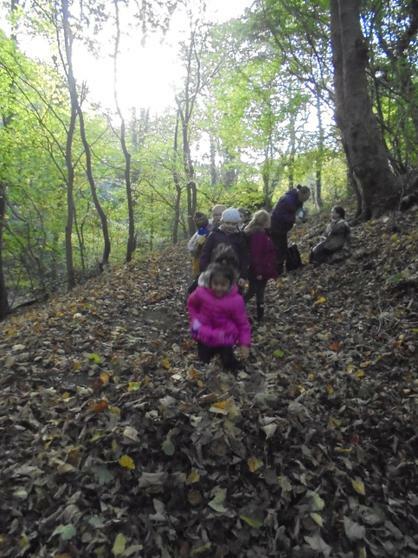 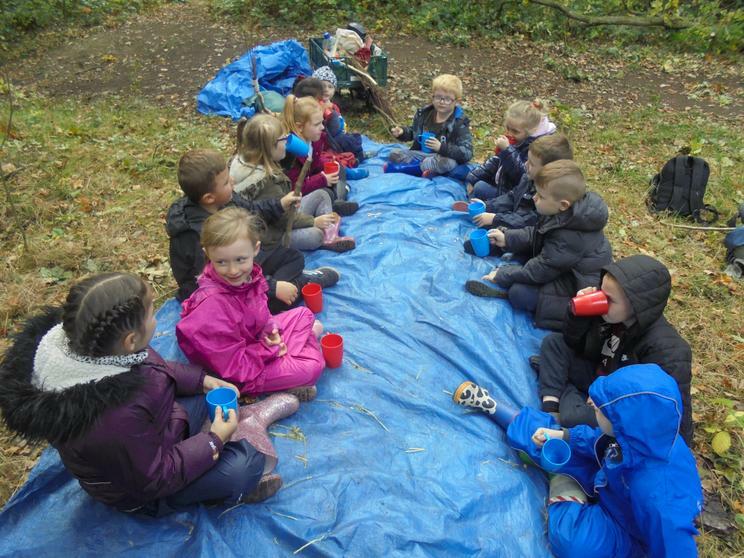 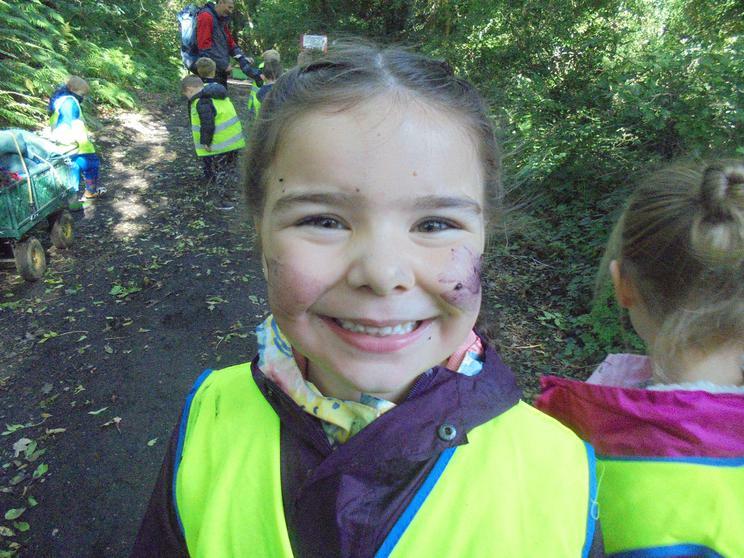 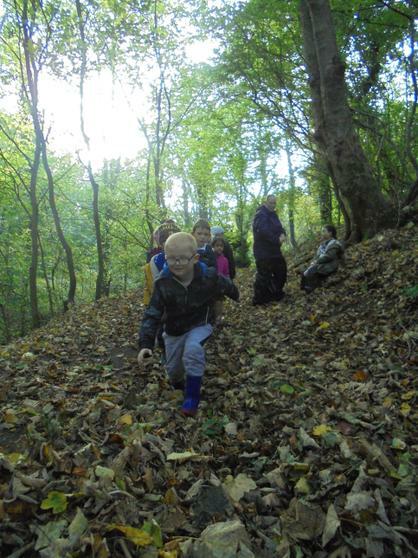 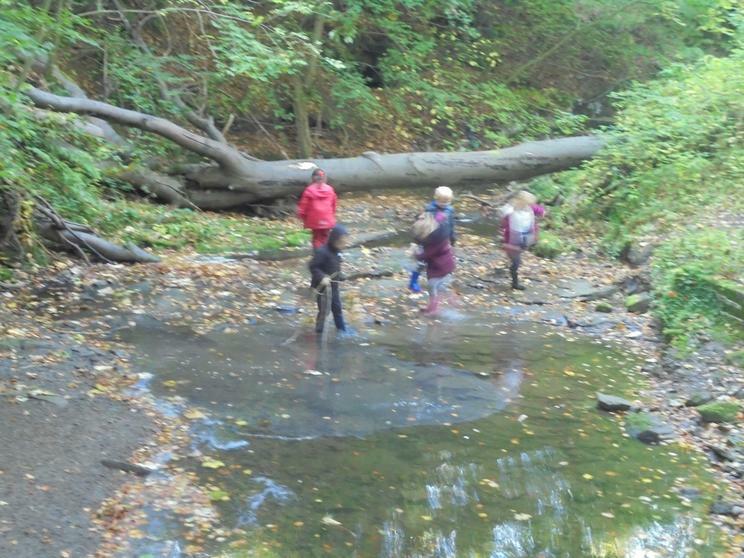 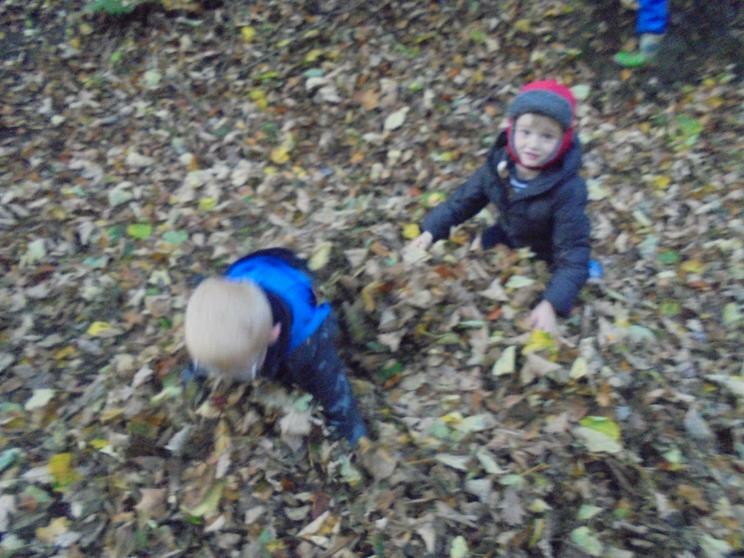 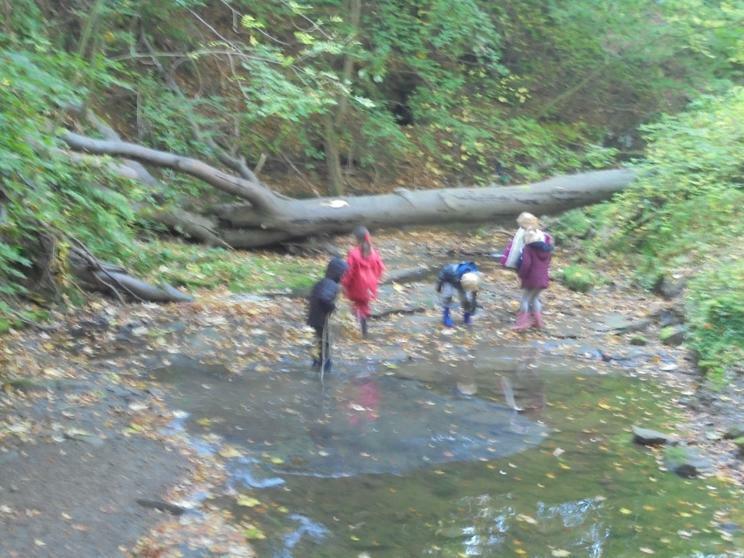 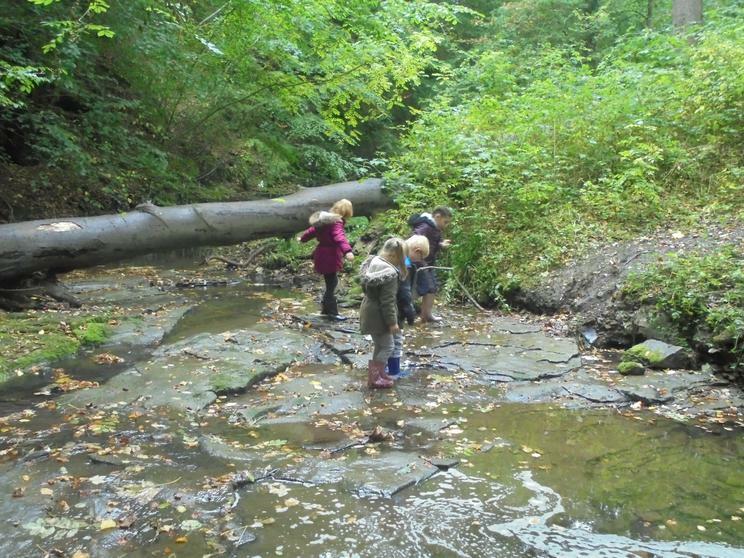 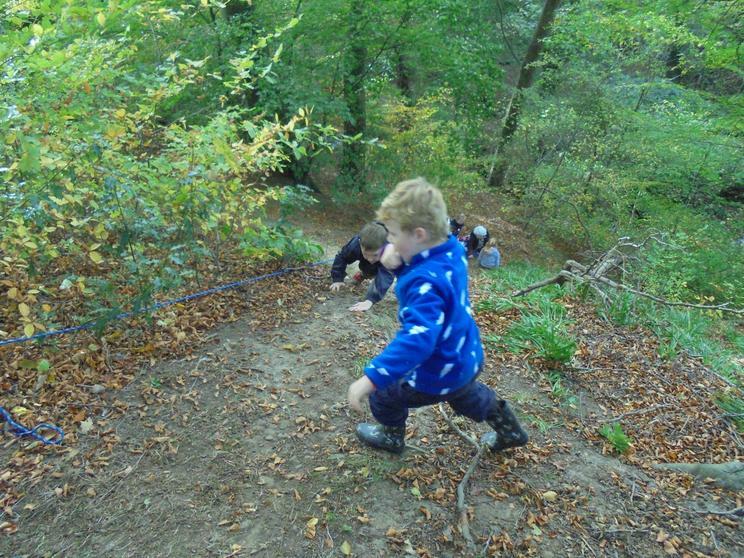 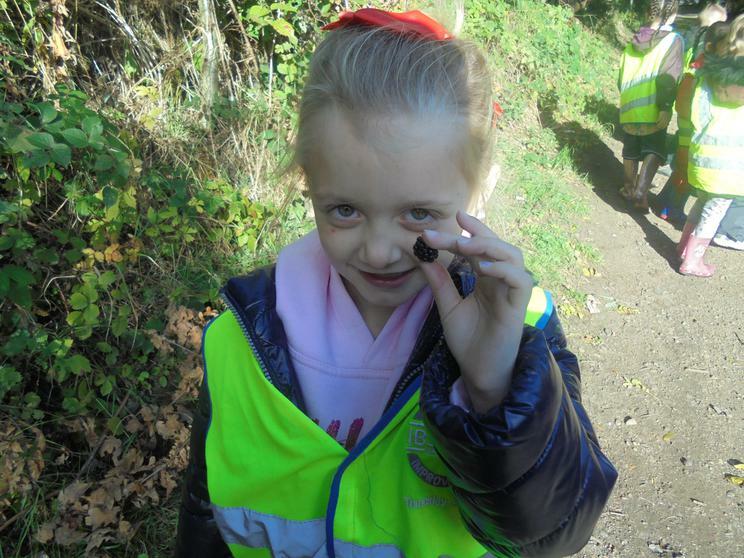 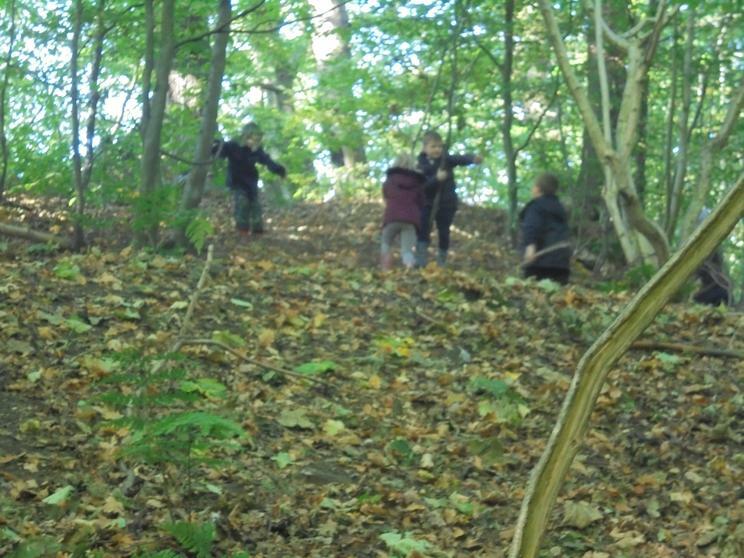 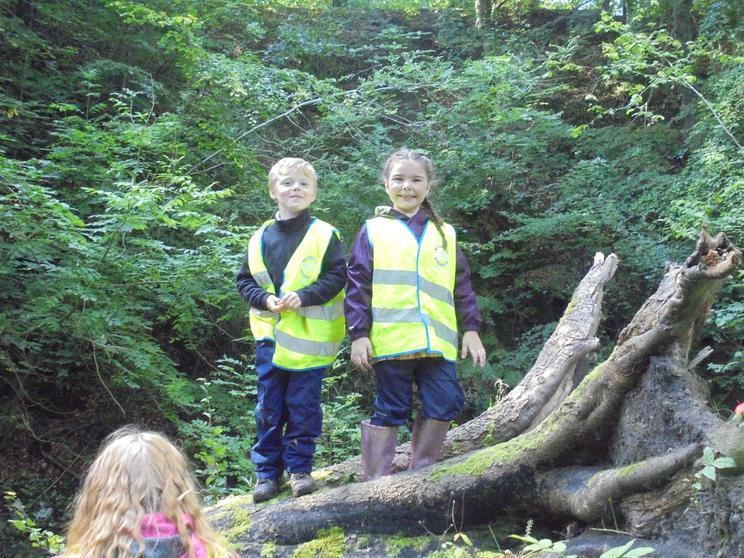 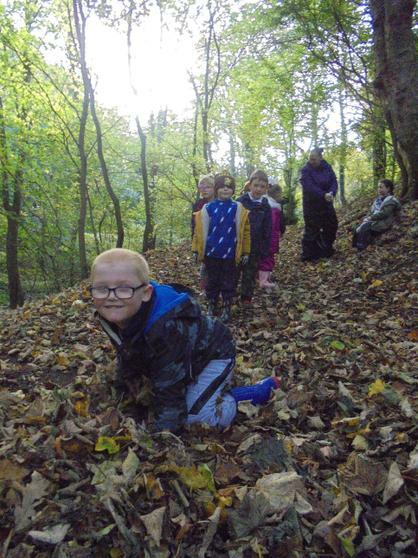 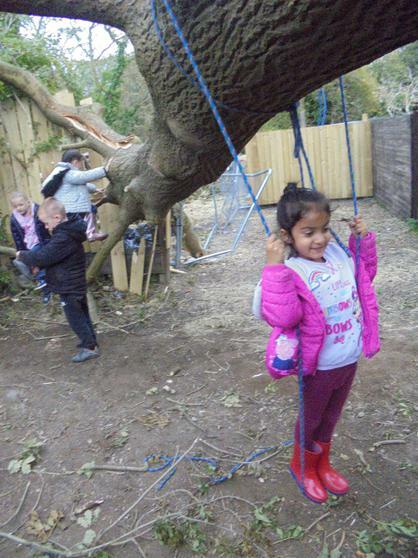 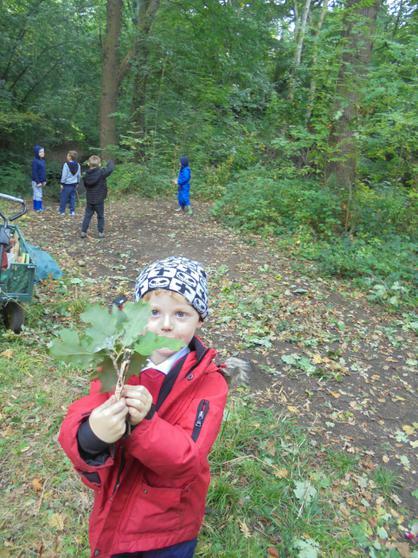 It is important to reflect and consider the time that the children have in the dene, we do this in a variety of ways. 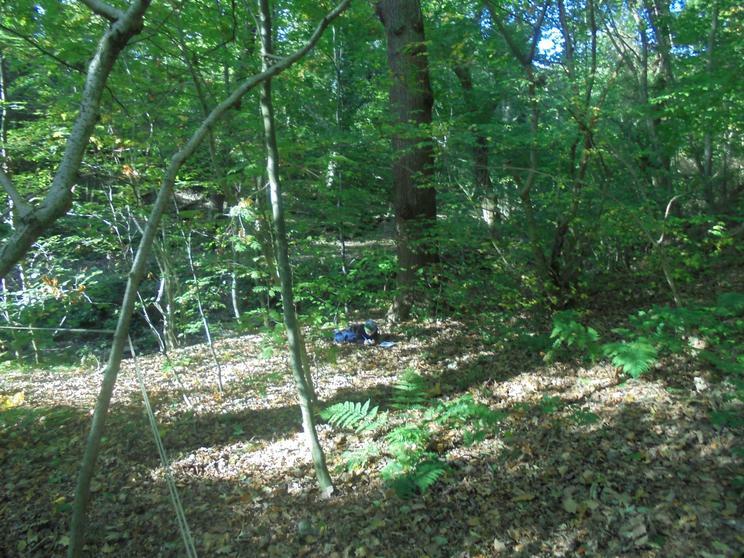 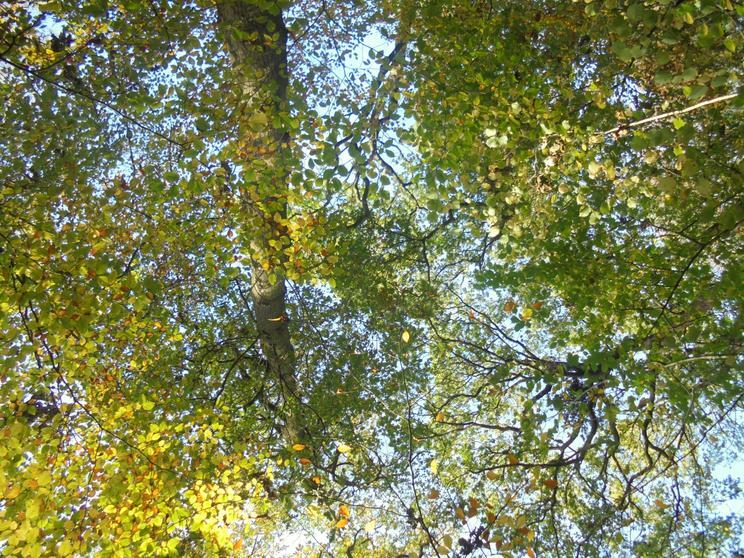 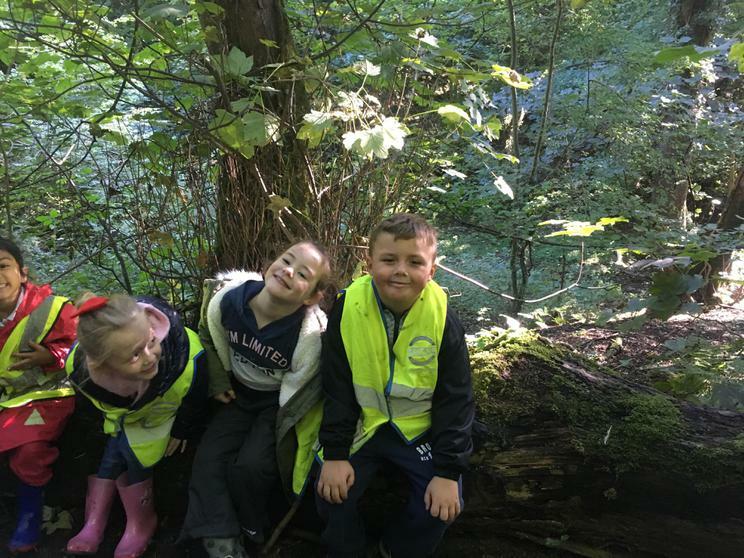 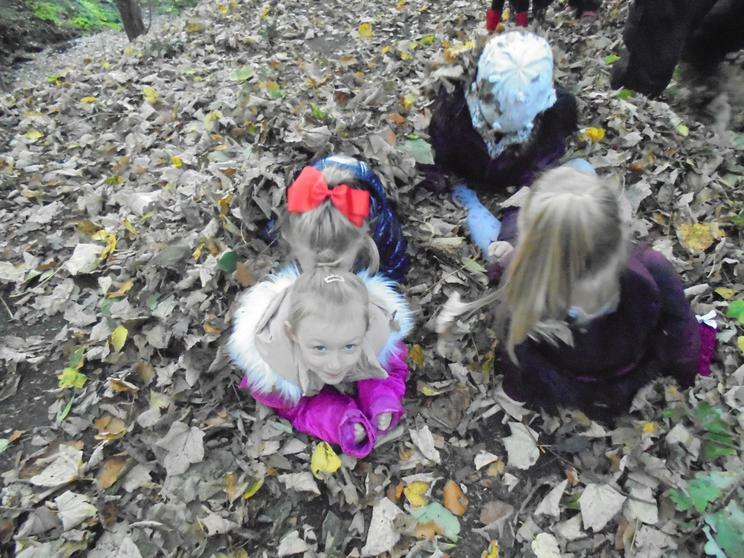 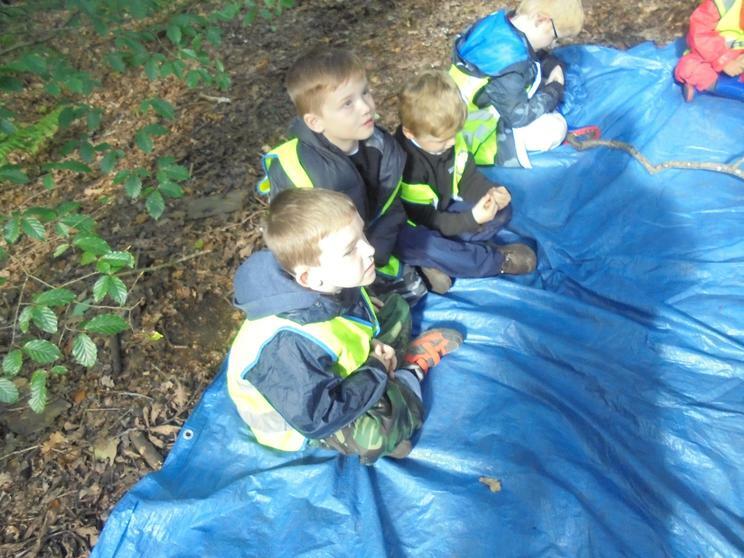 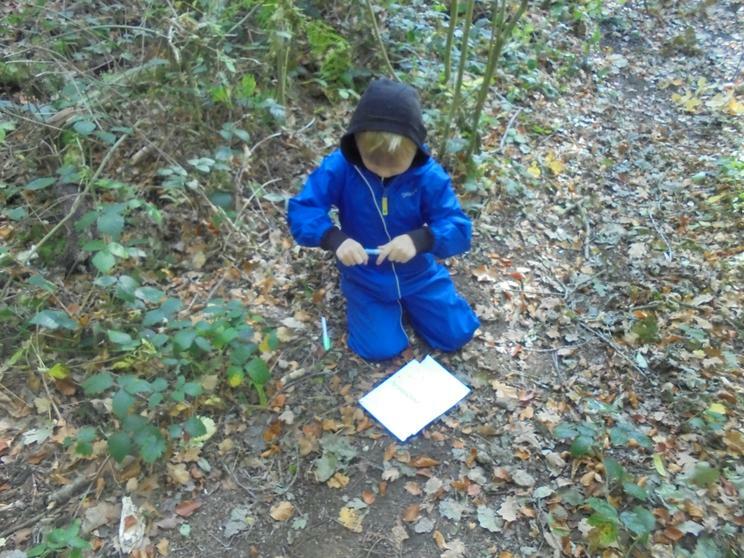 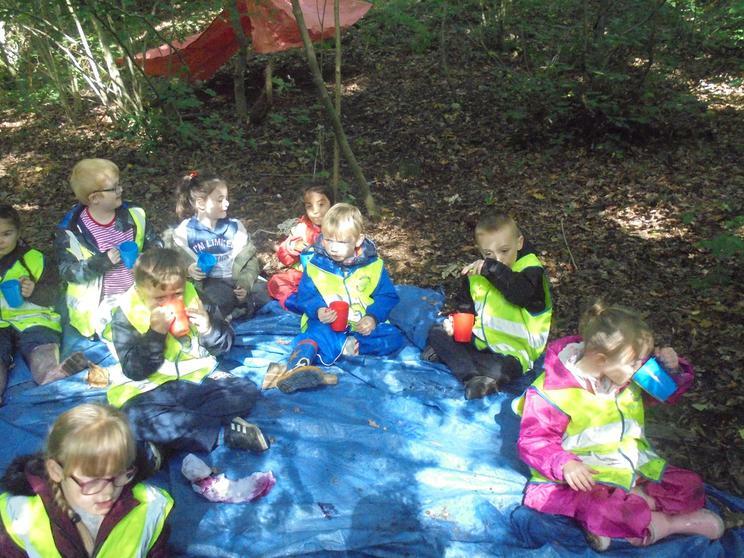 Today we found a quite spot and sat still for 5 minutes thinking of the things that we like about Forest School. 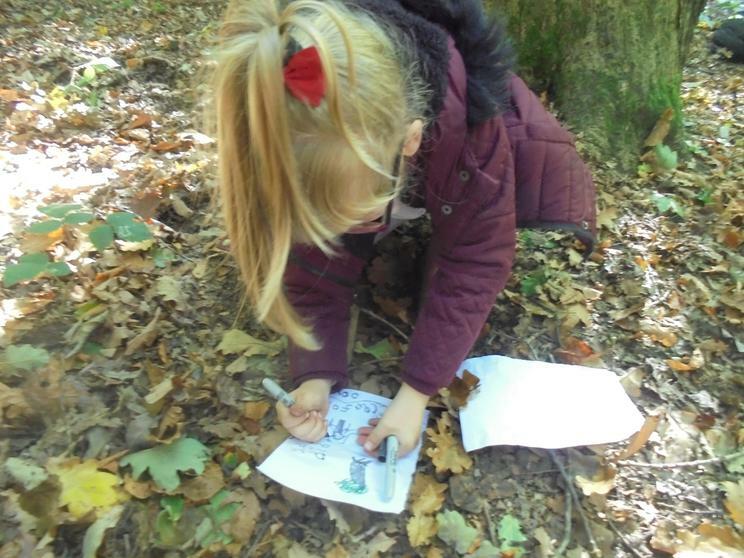 Some children wrote them down. 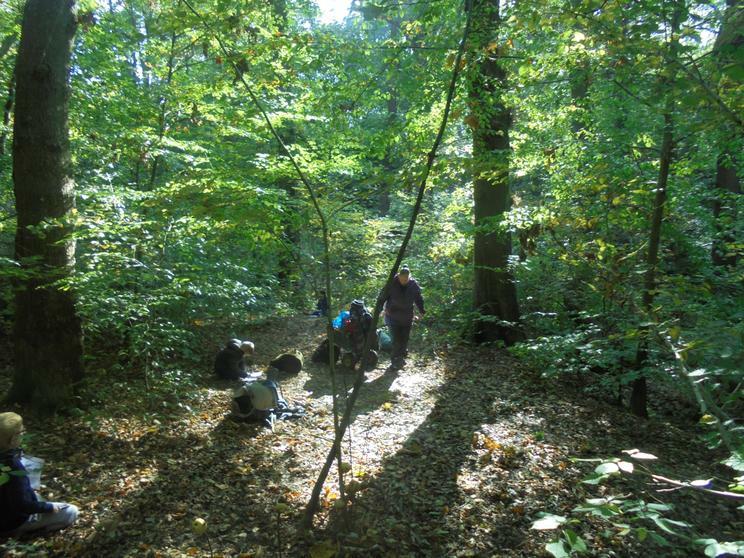 I don't think I have ever had a Forest School group do so much work in one session before. 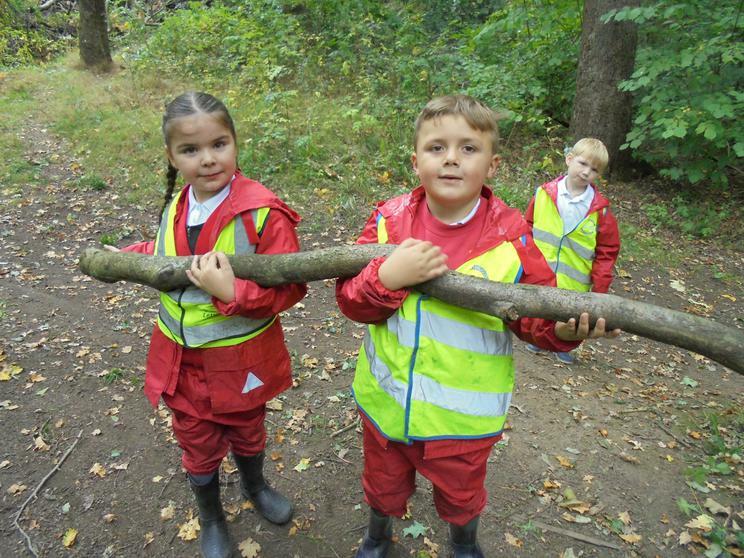 Today's focus was working together and co-operation. 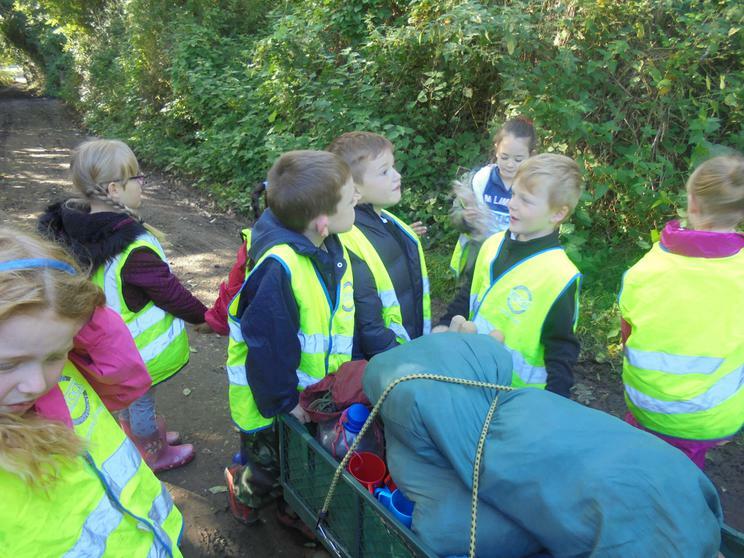 This started in the usual way of sorting out who would pull the buggy. 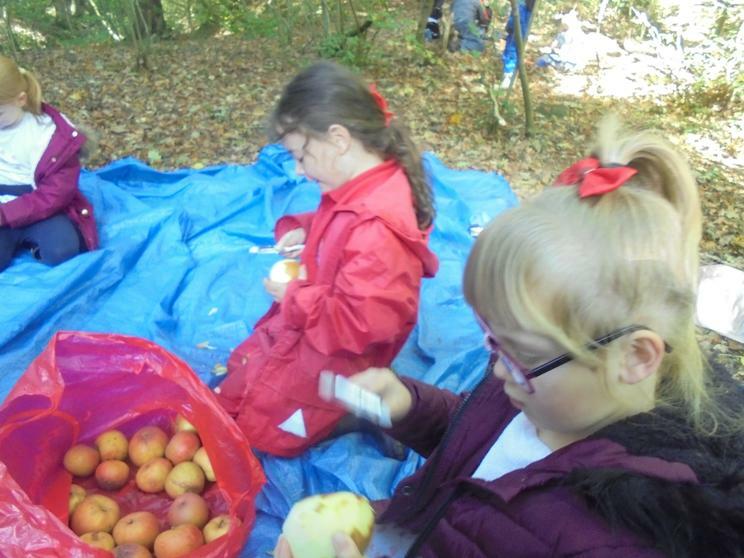 It was very full today so we had to change around frequently, everyone took a turn and some children helped more than once, thankyou Logan and Ellie-Mae. 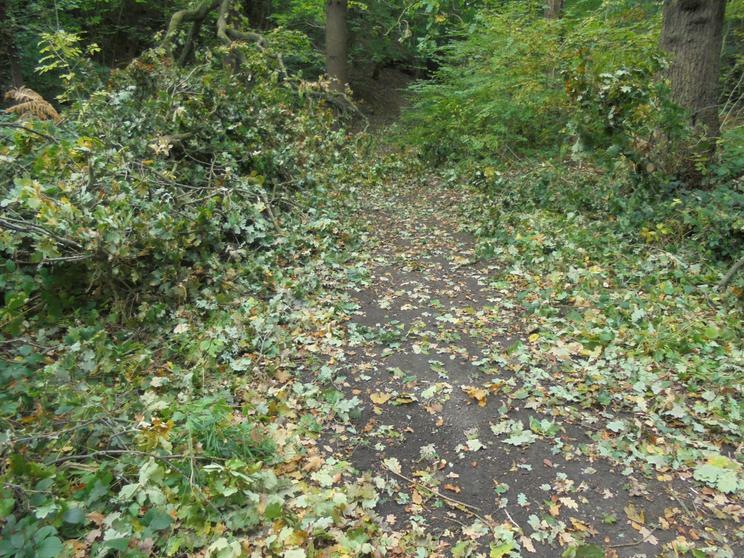 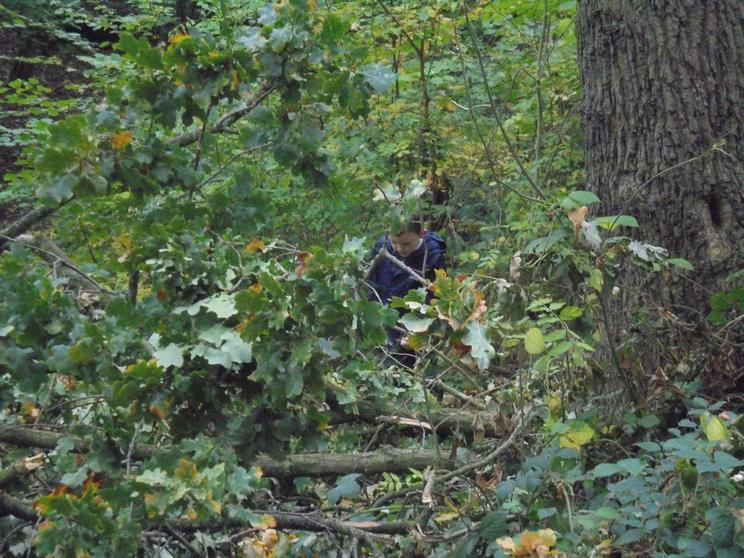 We saw that the tree that was blocking the path had been cleared up, but when we got to our site the trees were still all over the path. 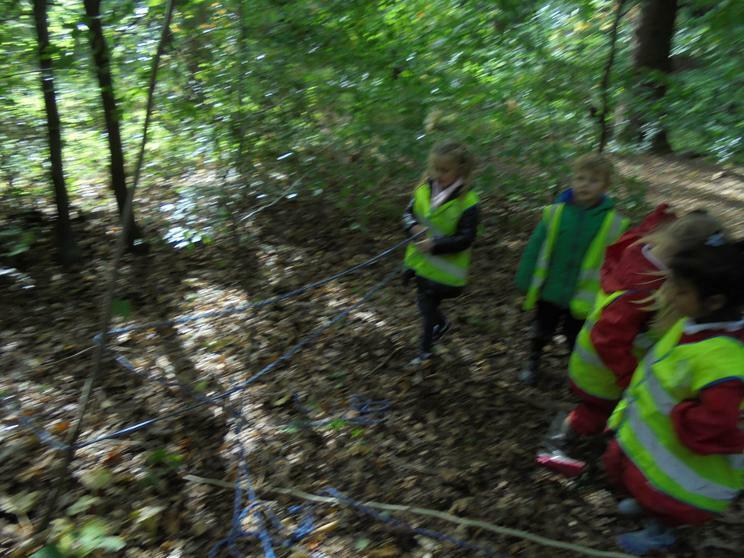 They were huge oak branches, much too heavy to pull out of the way. 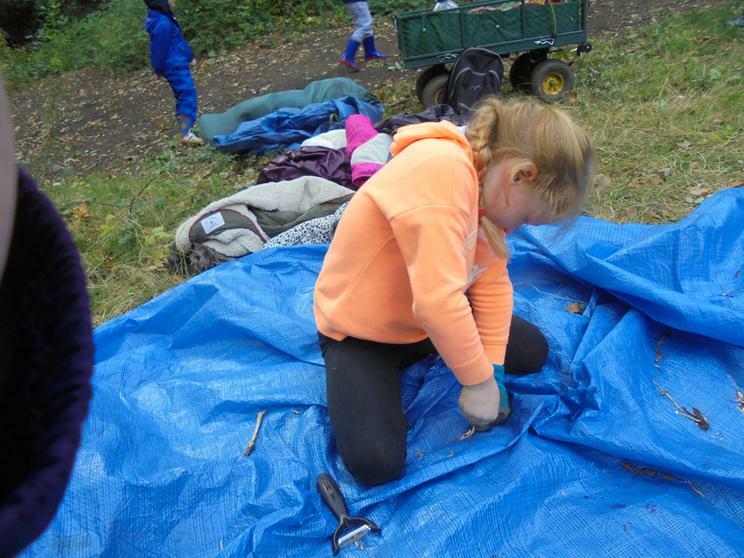 We set about sawing them up into smaller pieces. 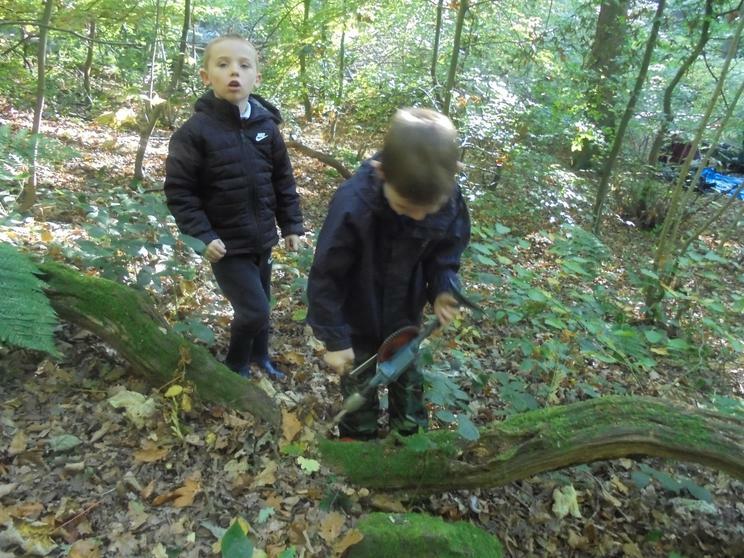 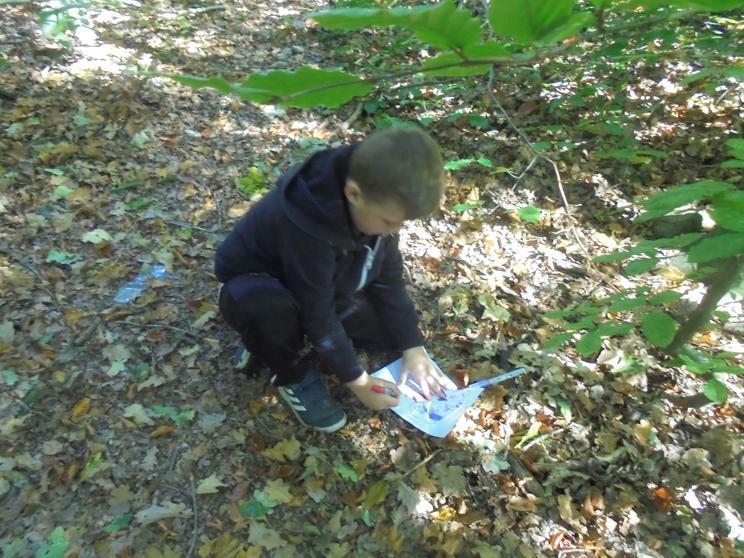 We noticed that in some of the broken bits earwigs and woodlice had already moved in so Fraser and Hayden drilled more holes in the dead wood so that more insects could find a home. 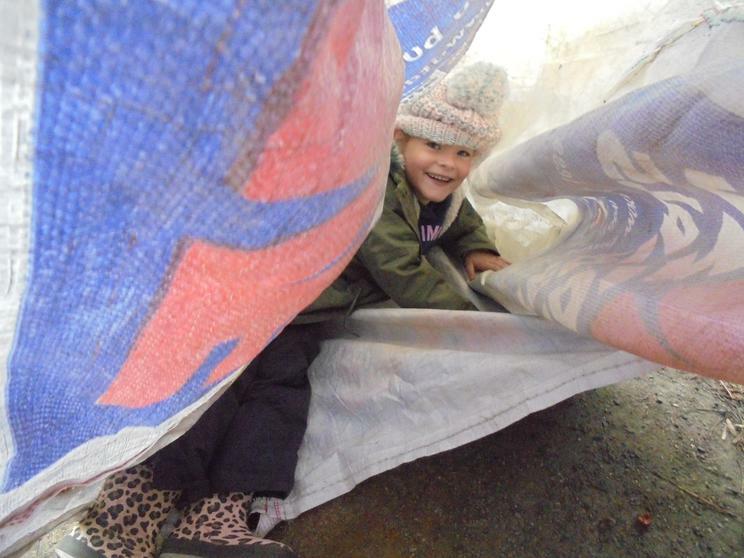 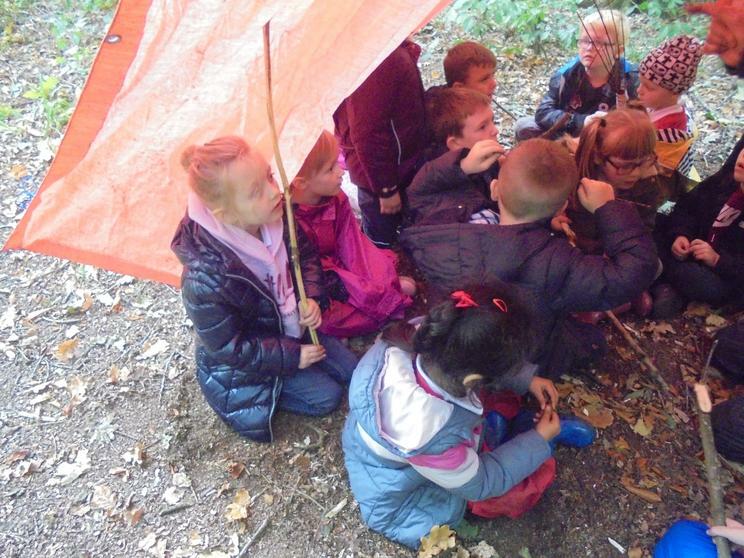 Jackson loves making dens so he started to make us a shelter in case it started to rain. 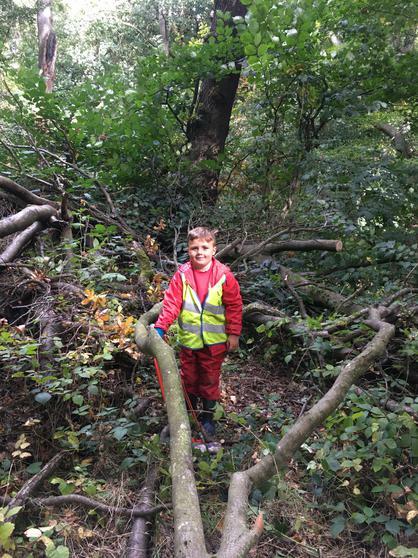 He had some brilliant ideas but needed help. 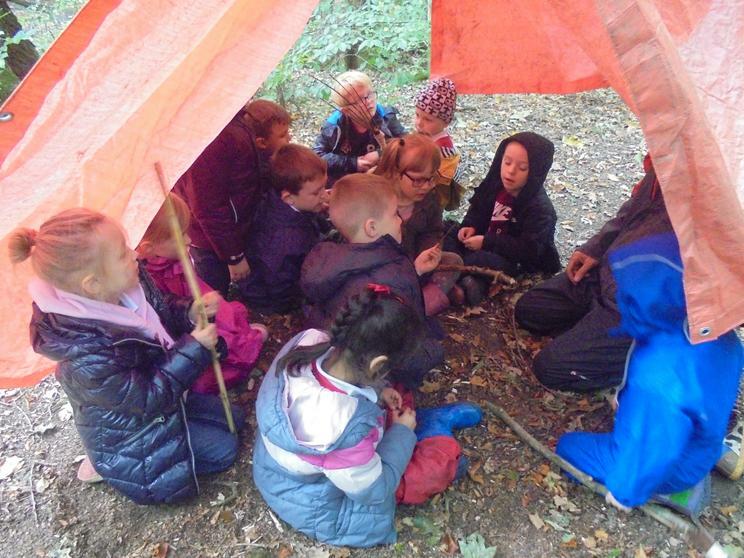 Poppy started to help him, we could all fit in the den. 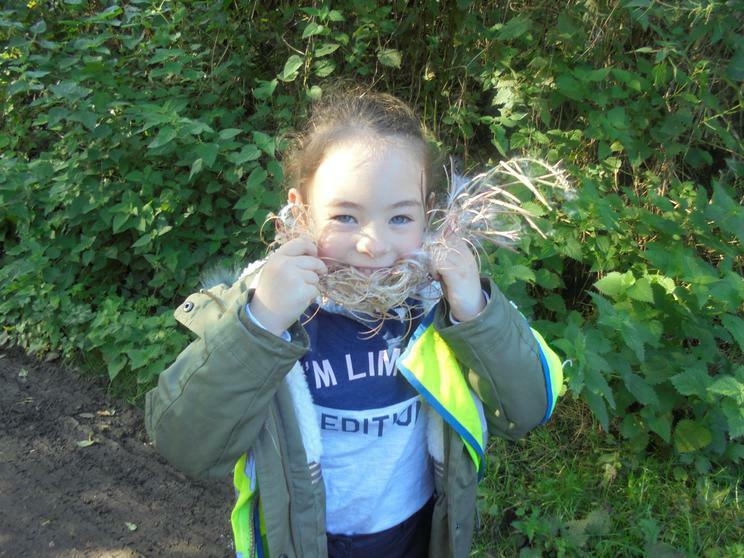 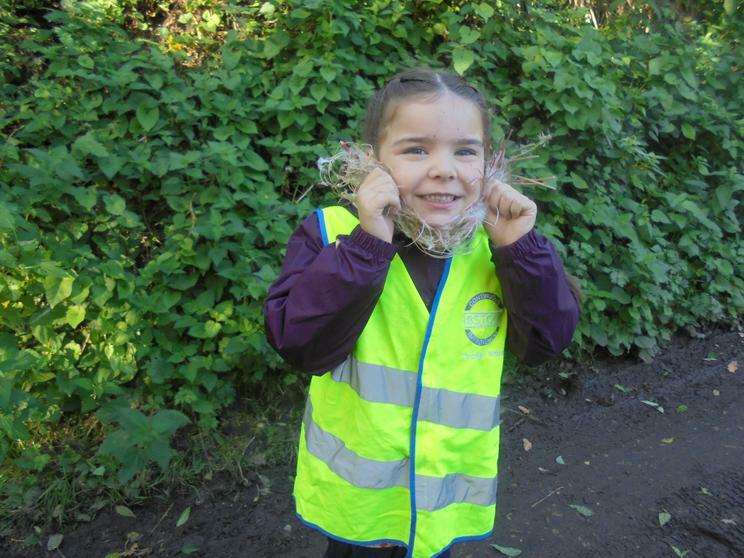 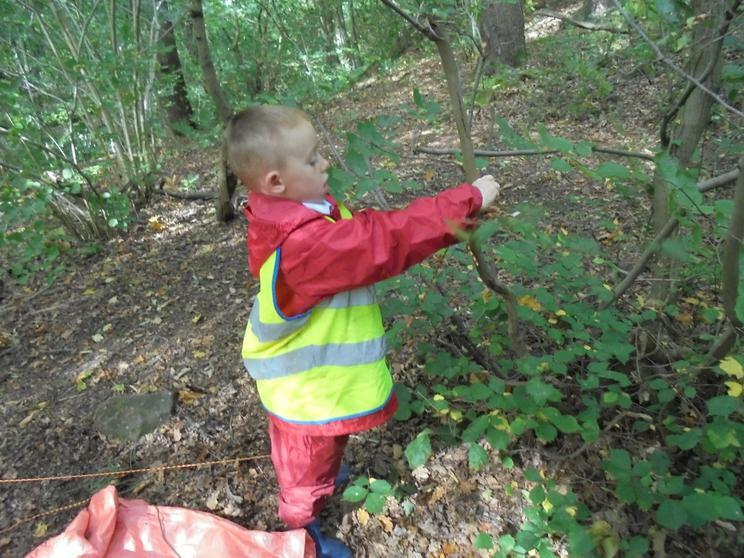 A lot of children wanted to make brooms so that we could sweep up the leaves so we did. 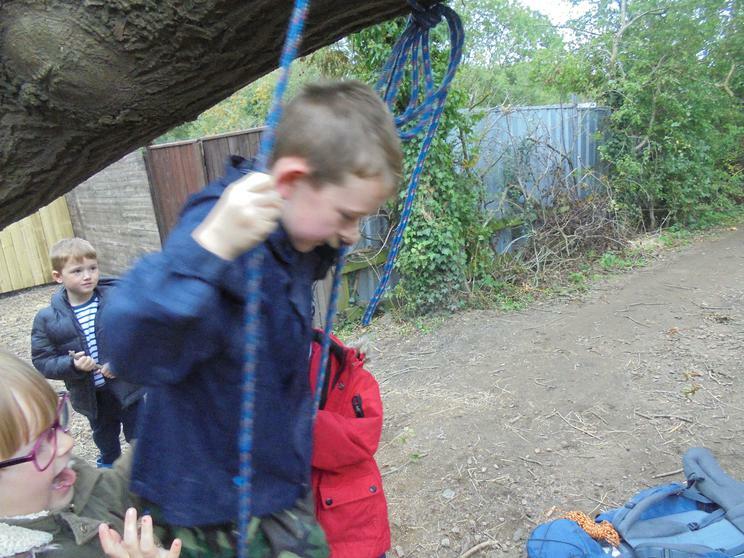 Look at the difference we made. 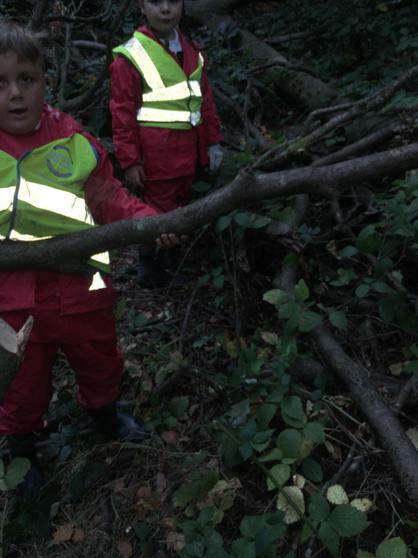 We cleared the whole path. 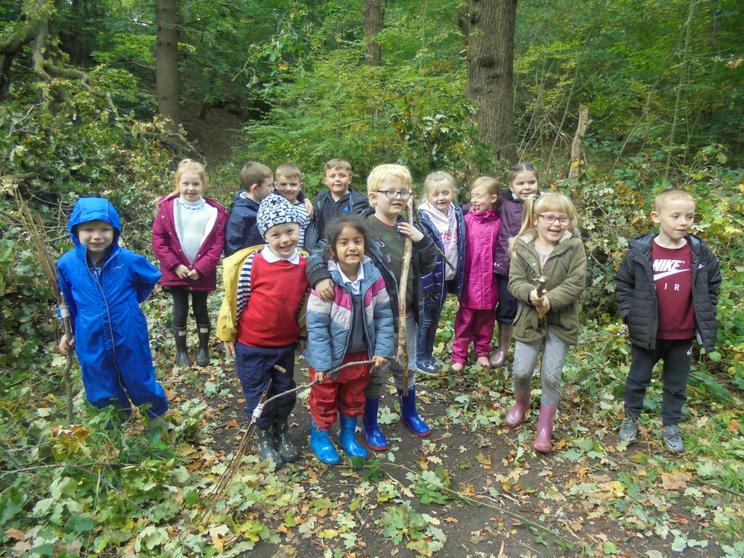 Well done Newburn Manor. 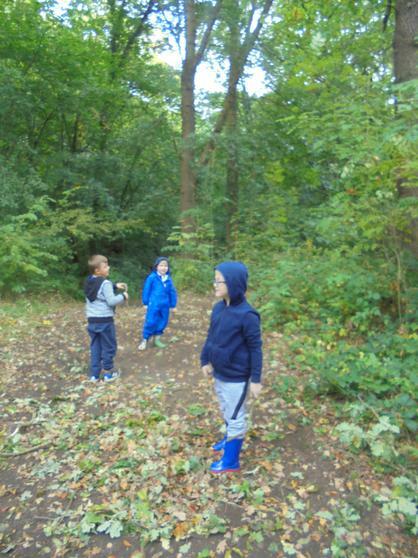 Today on the way to the woods Logan was telling us how the trees had fallen down. 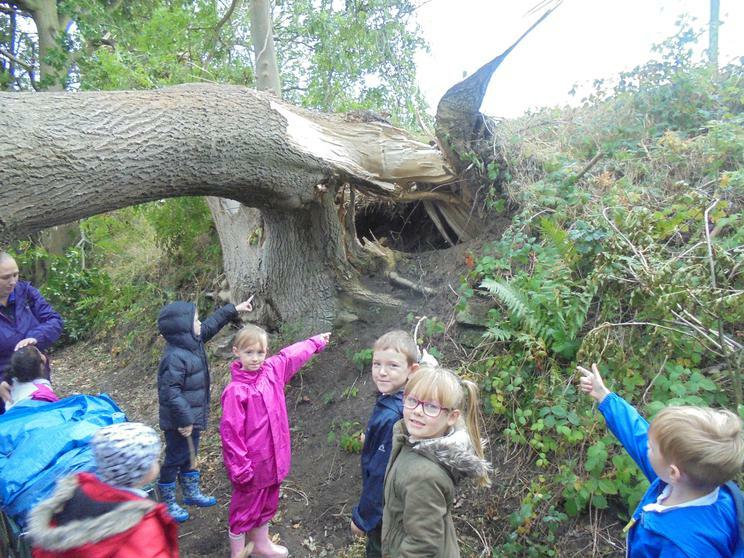 When we got around the corner we couldn't believe how big the tree was! 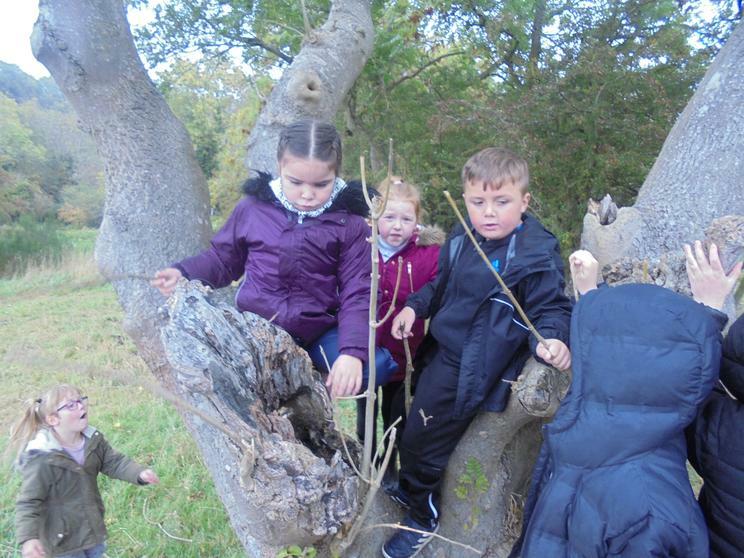 After checking the tree we set about exploring it. 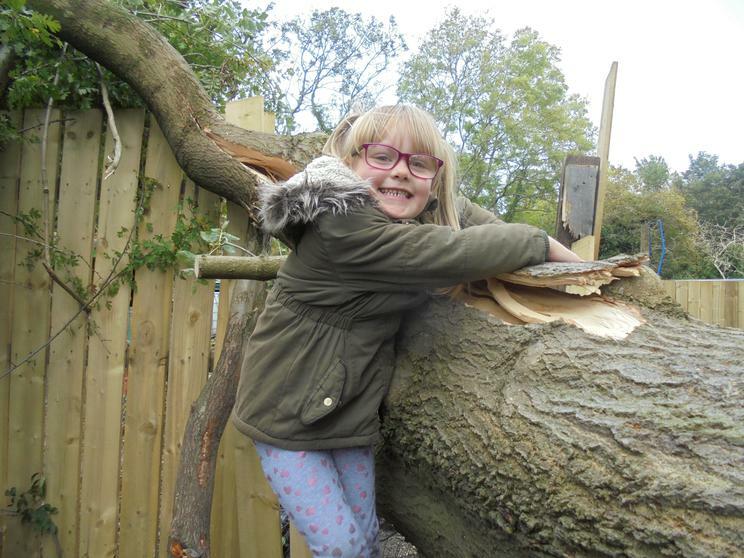 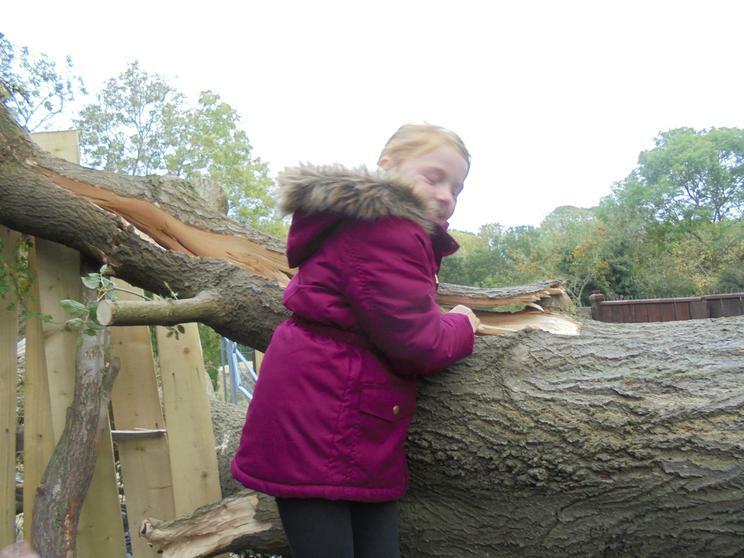 A great big Ash tree had been blown across the path last week. 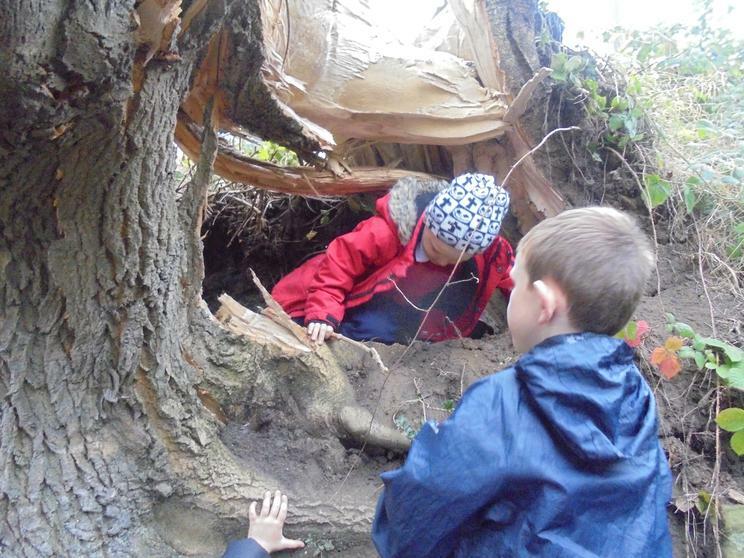 Children climbed it, found dens in it and used it to hang ropes from. 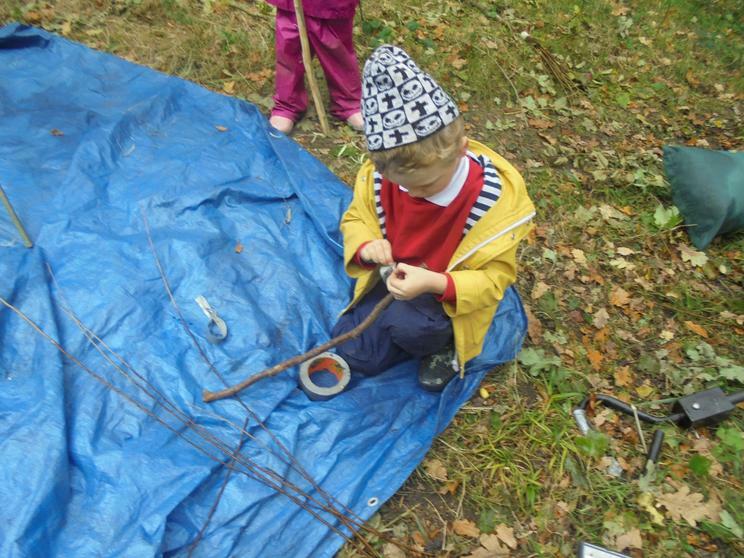 Some of the twigs made great stick men. 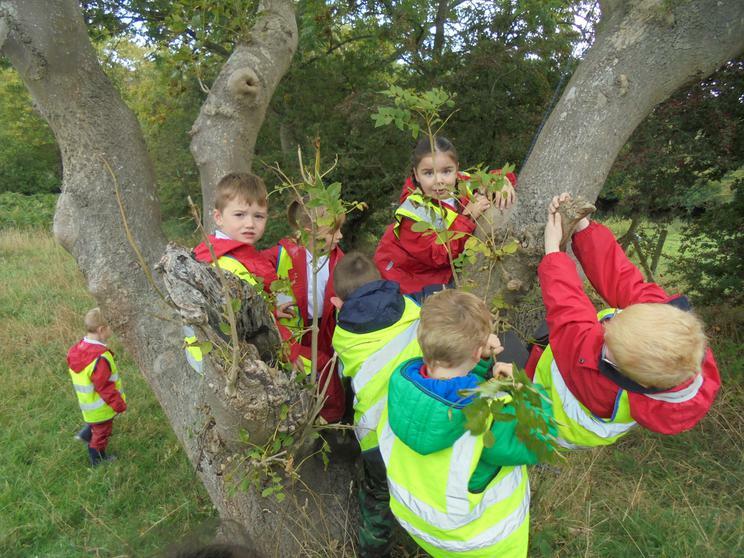 It took us along time to get past the tree. 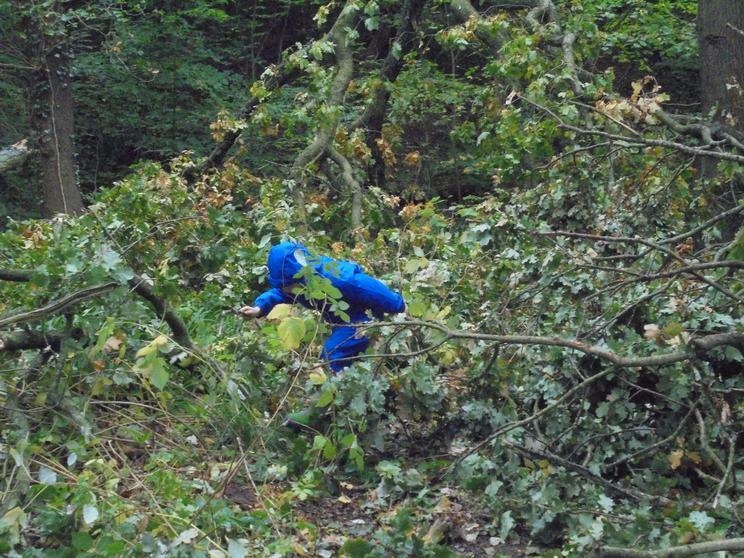 When we got to our base in the dene we saw that even more trees had been blown down. 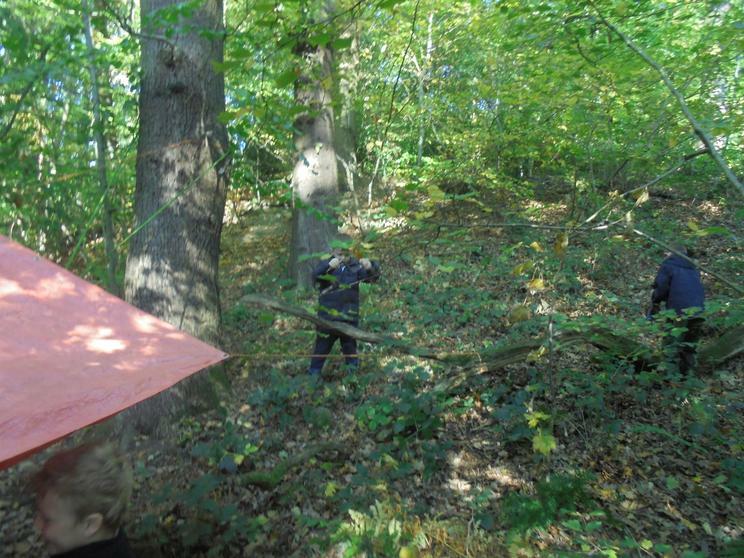 We had to set up camp in a new area, but with the path completely blocked it would be alright. 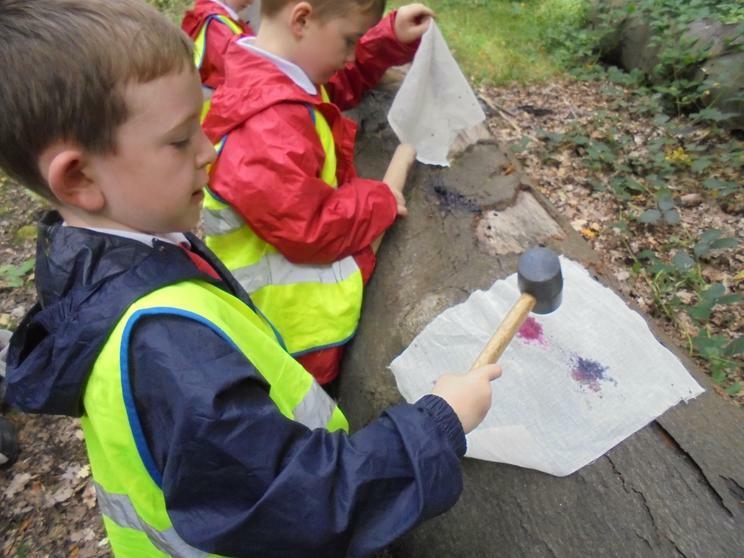 Some pupils want to make some more stick me others wanted to use the tools to work on the wood. 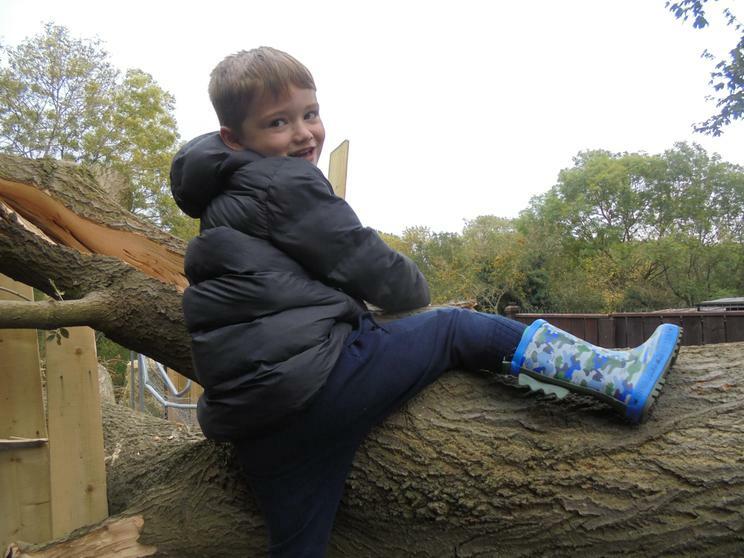 Hayden is keen to take his picture from last week home, he is in the process of making a frame for it. 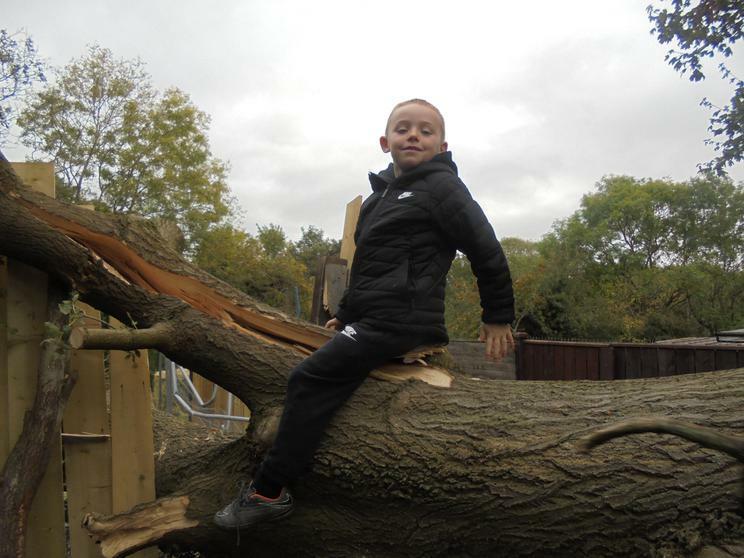 There is certainly plenty of wood about. 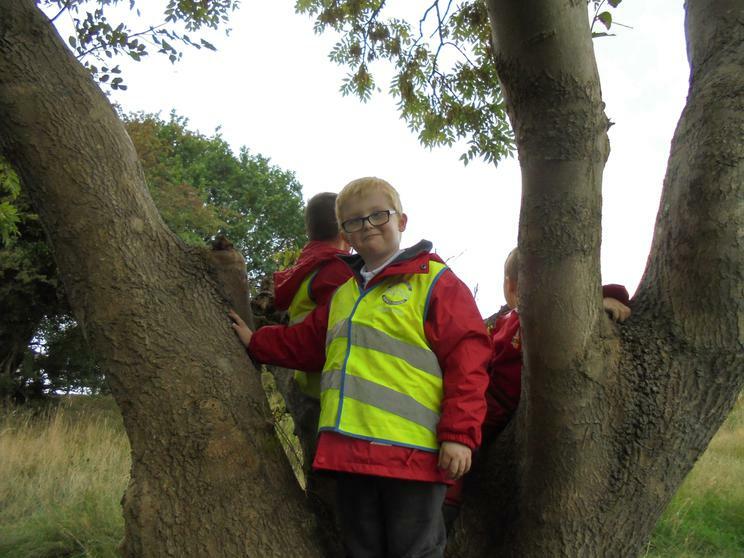 Fraser found that just under the bark of the oak tree the tree is orange. 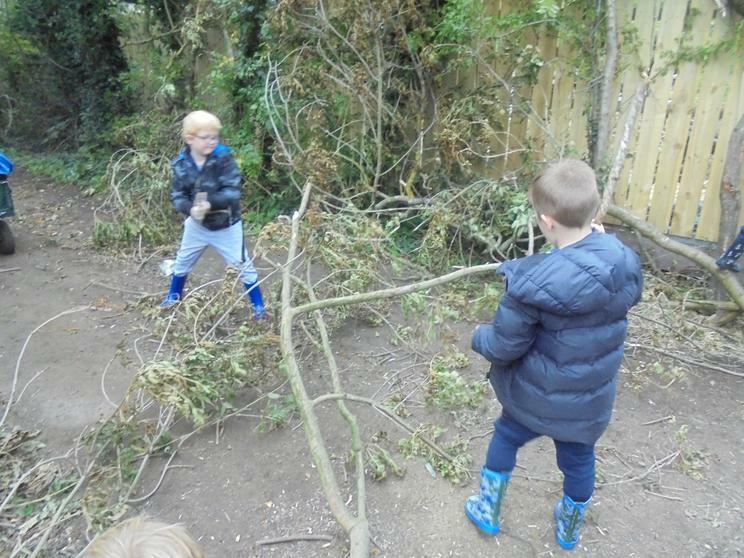 Other children used the sticks for a game of Ghost Busters. 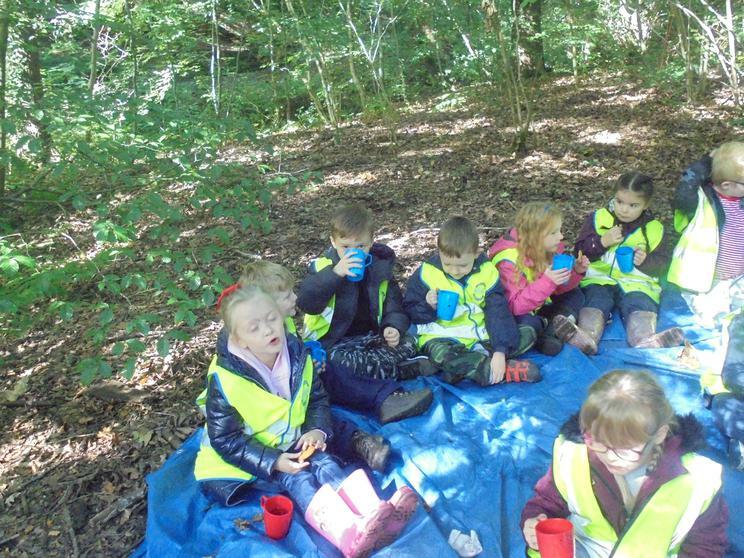 We were all so busy that we almost late for lunch! 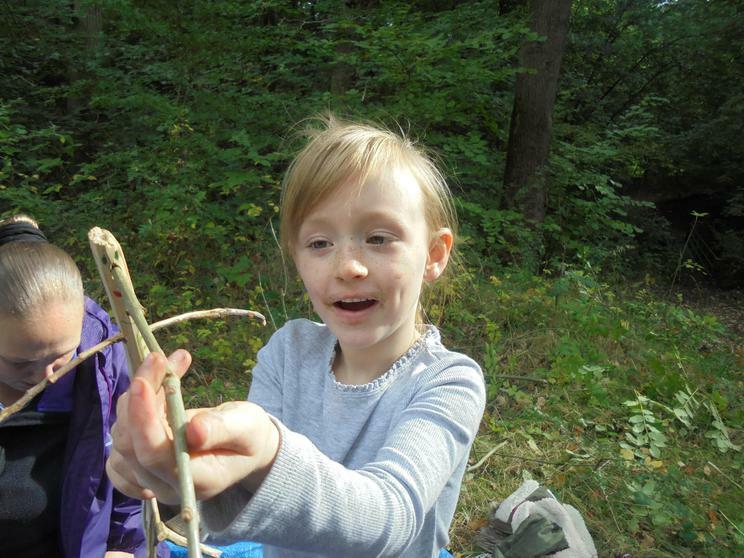 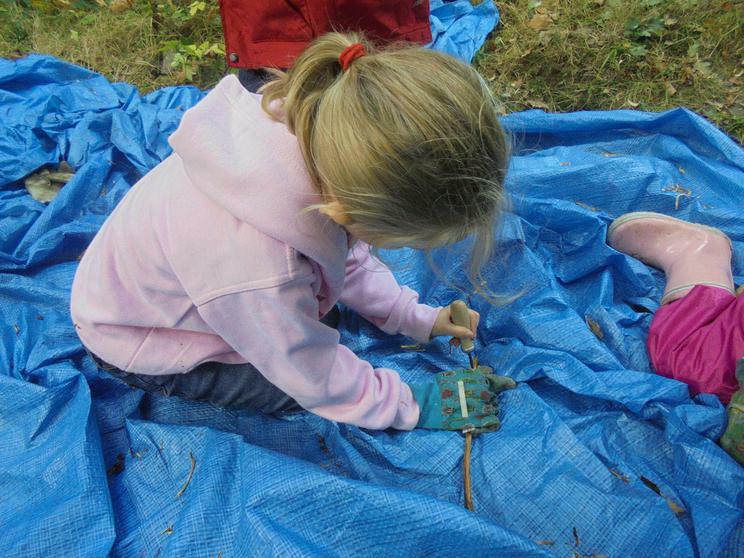 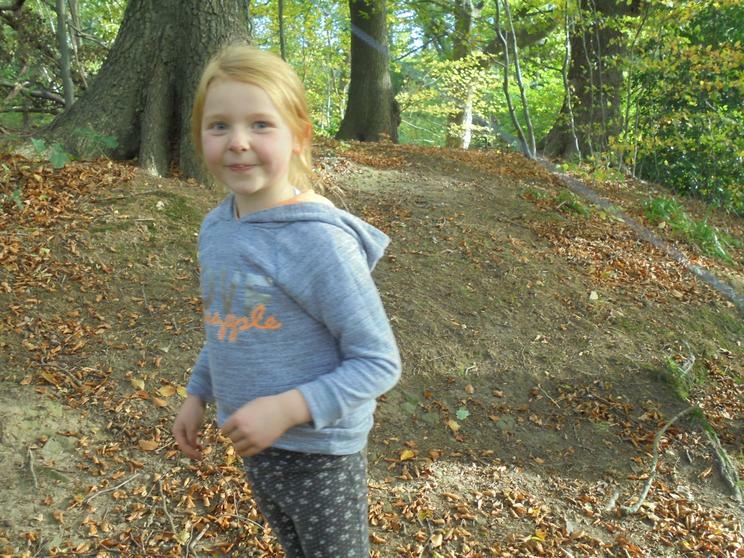 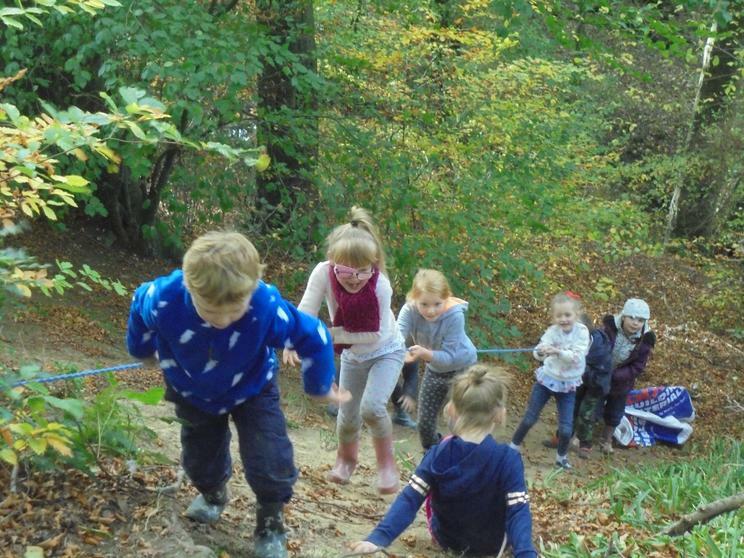 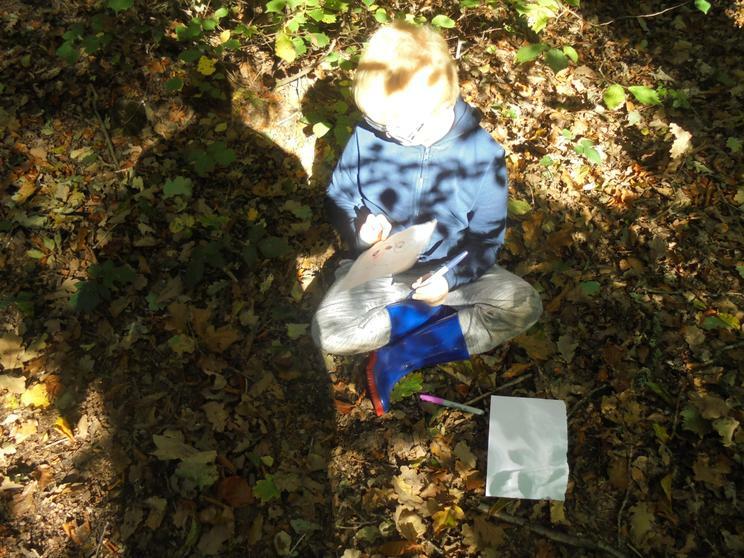 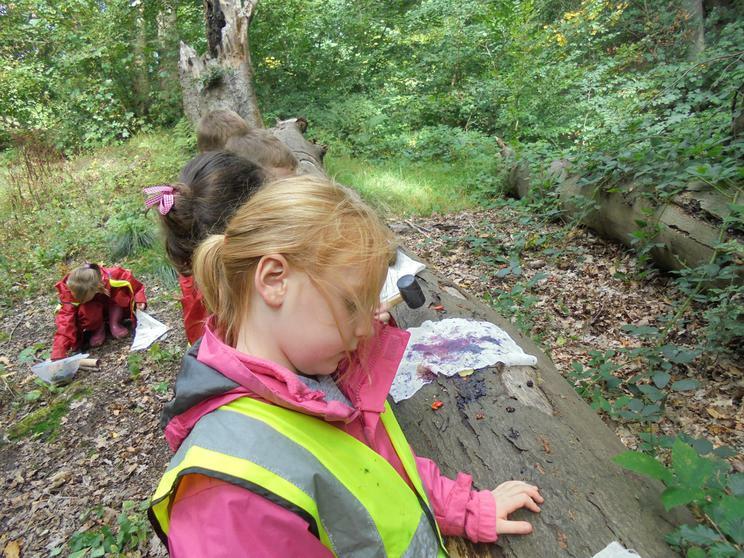 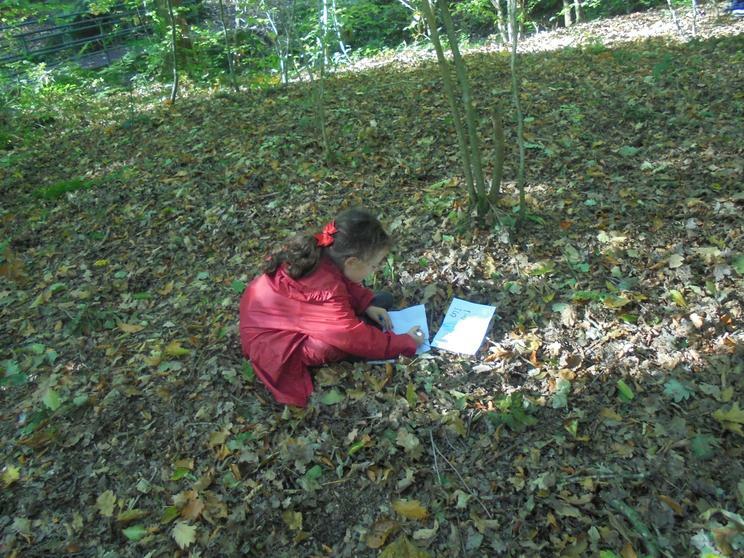 enjoy the pictures of some very busy Forest Schoolers. 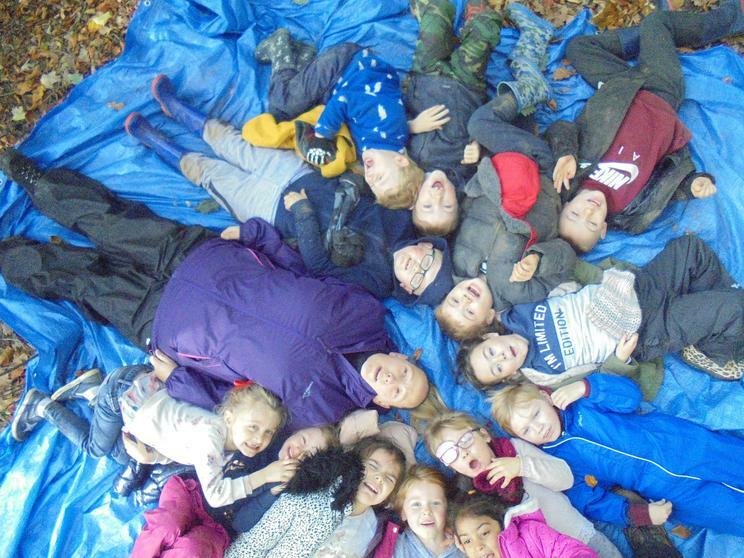 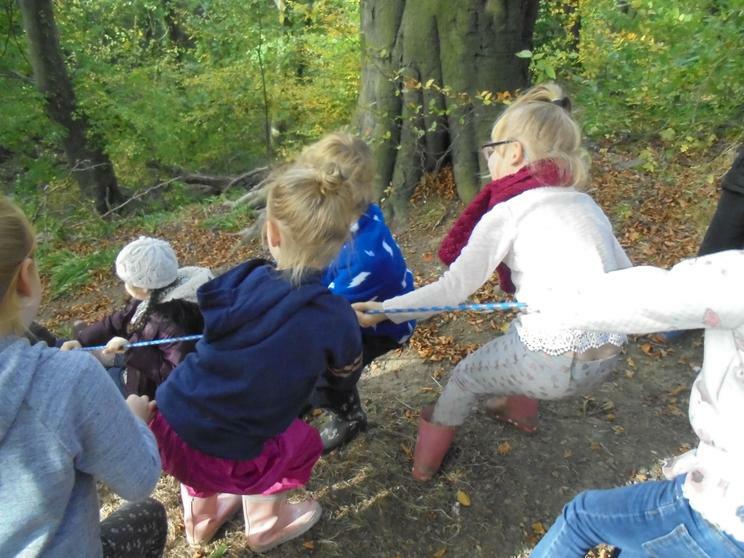 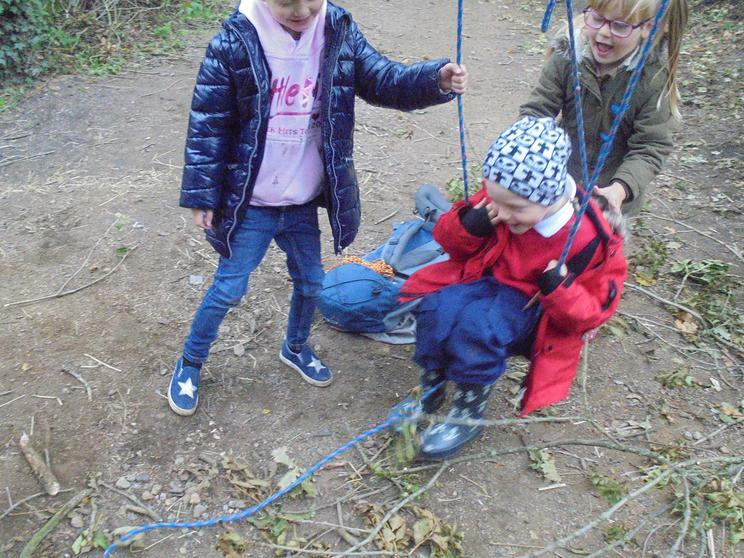 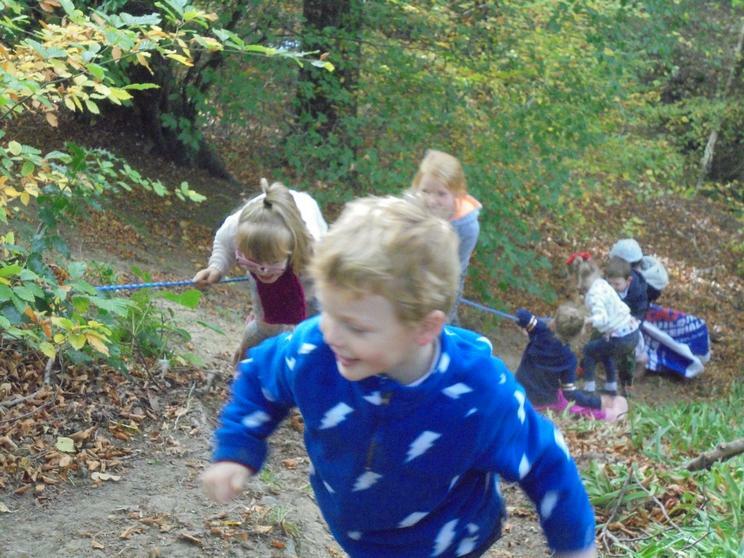 After making sure that the wind in the dene wasn't too strong we took the children out for their second of six Forest School session. 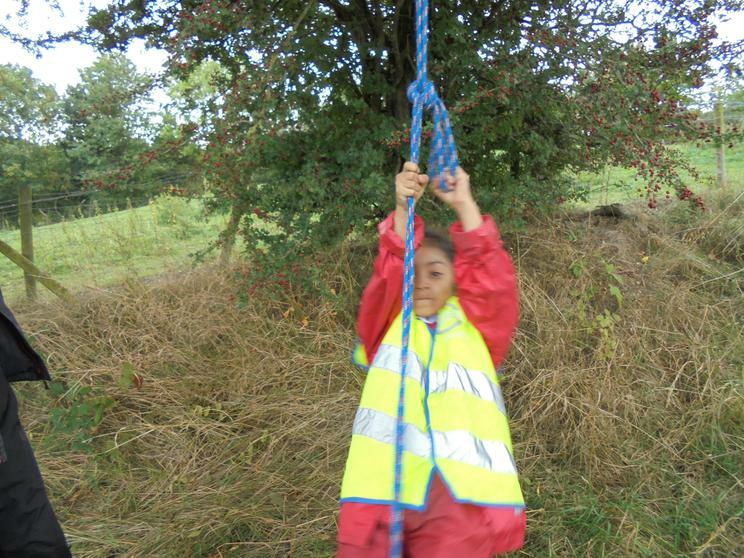 It is nice to see how the children are staring to make decisions as to what activities they would like to do. 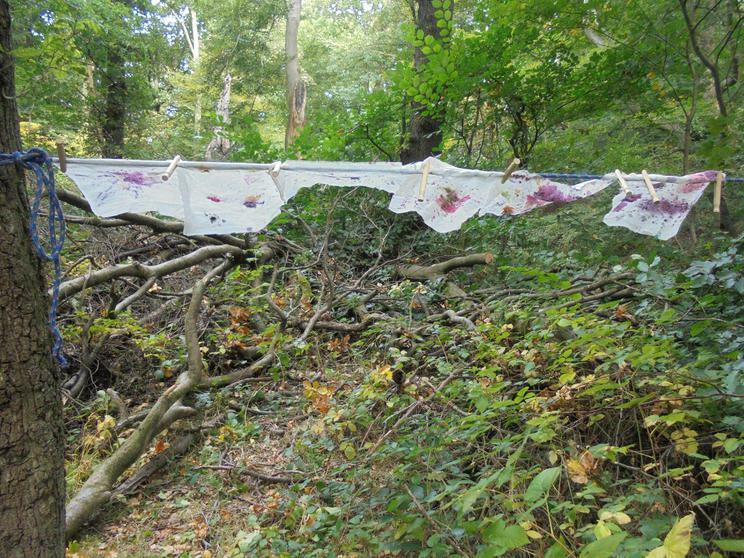 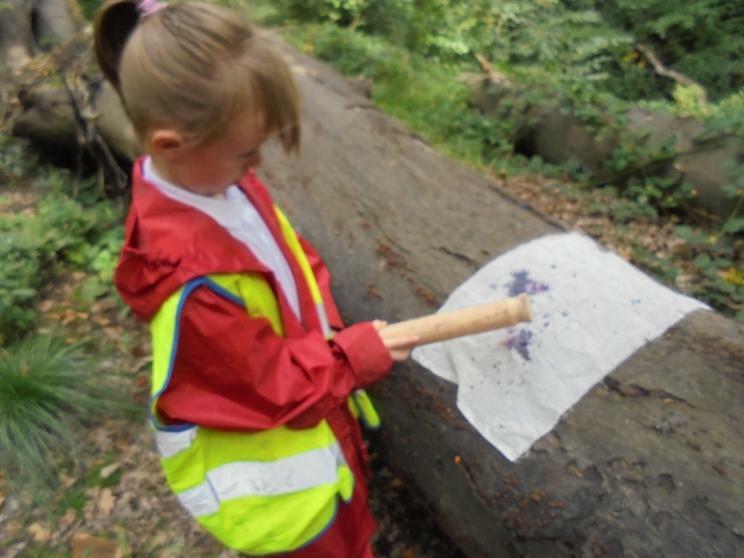 We had children using berries, hips and haws to make pictures onto cloth. 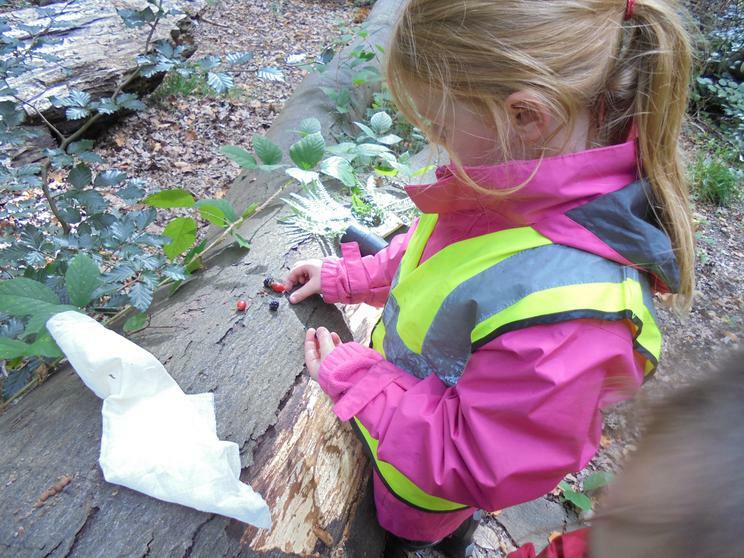 The method of splatting the berry through the cloth is very satisfying. 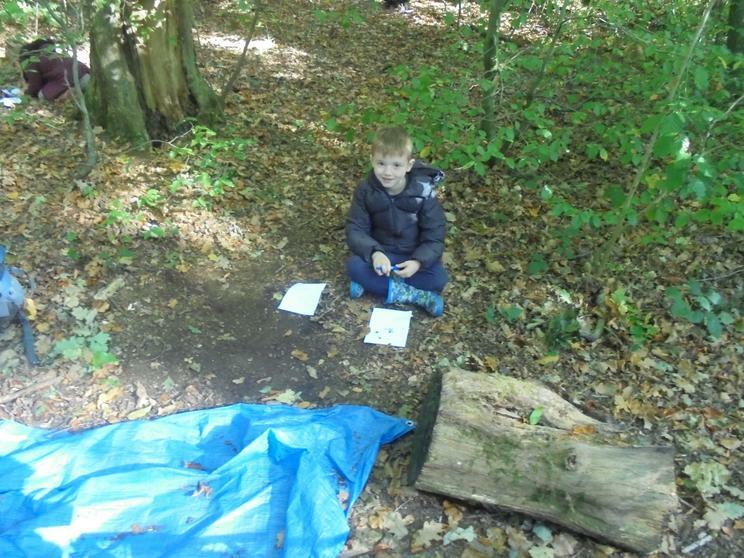 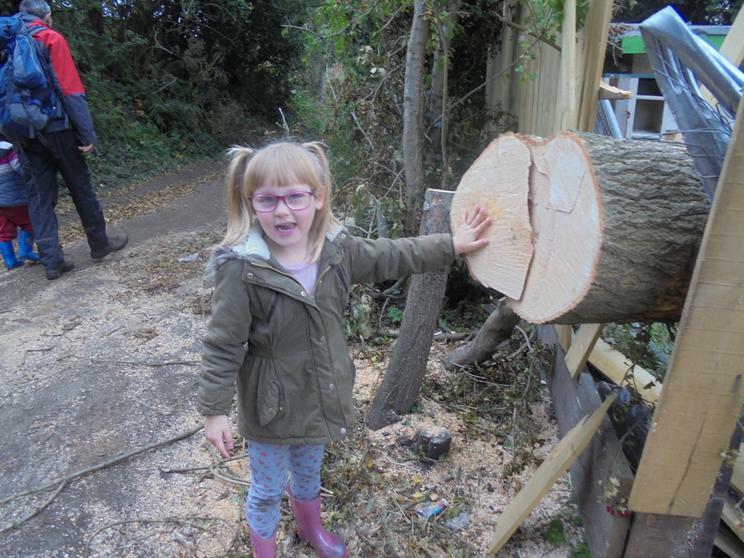 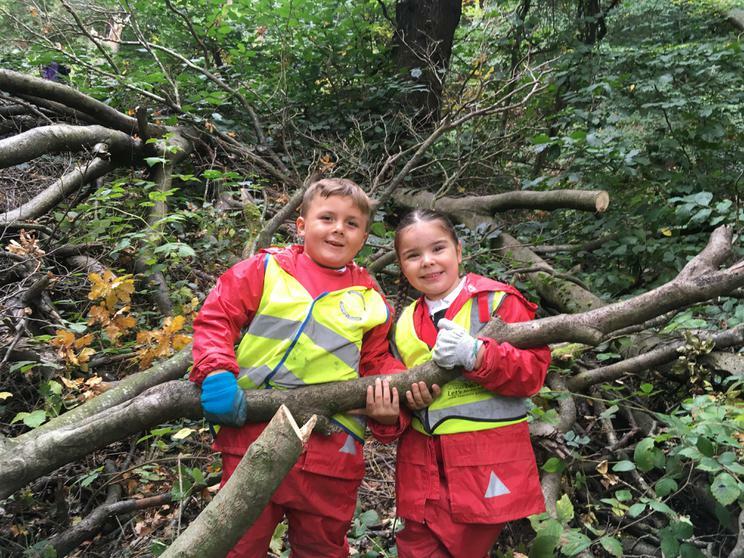 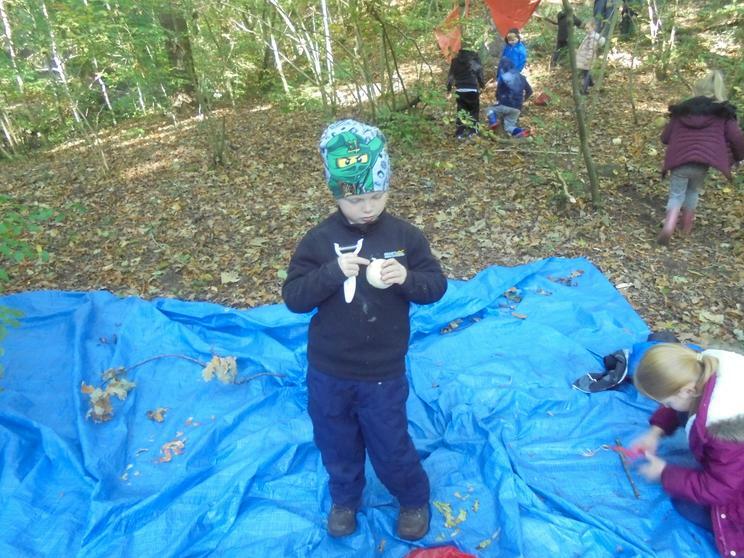 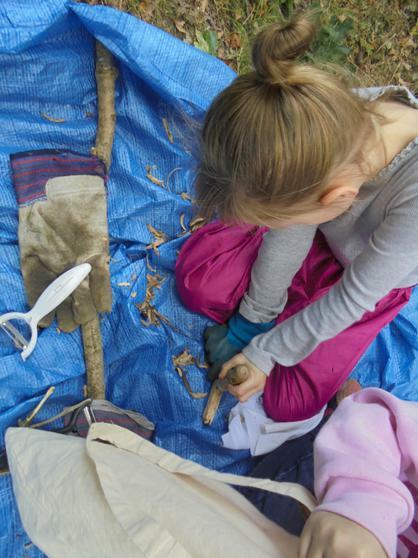 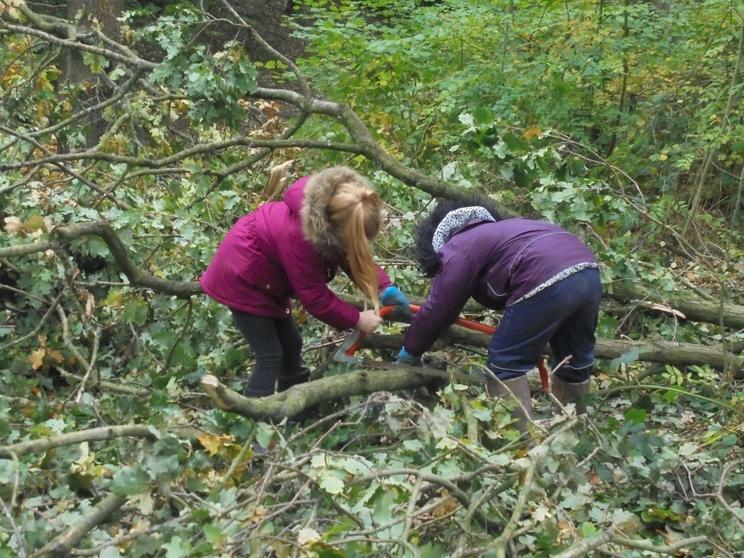 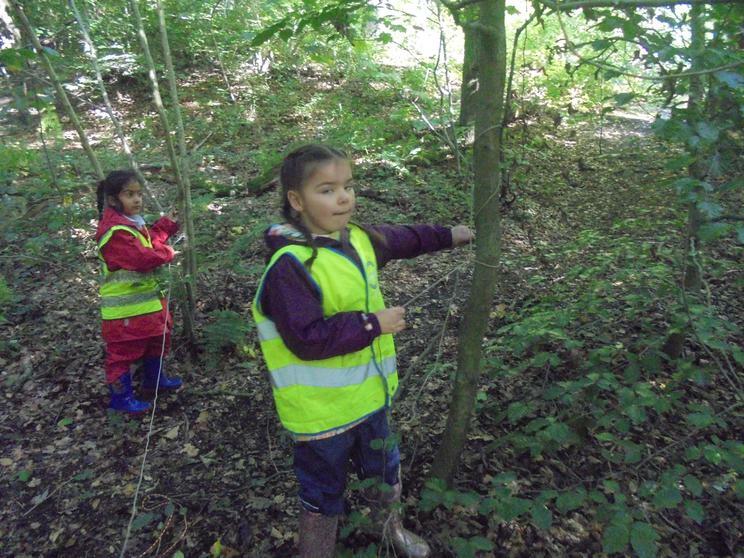 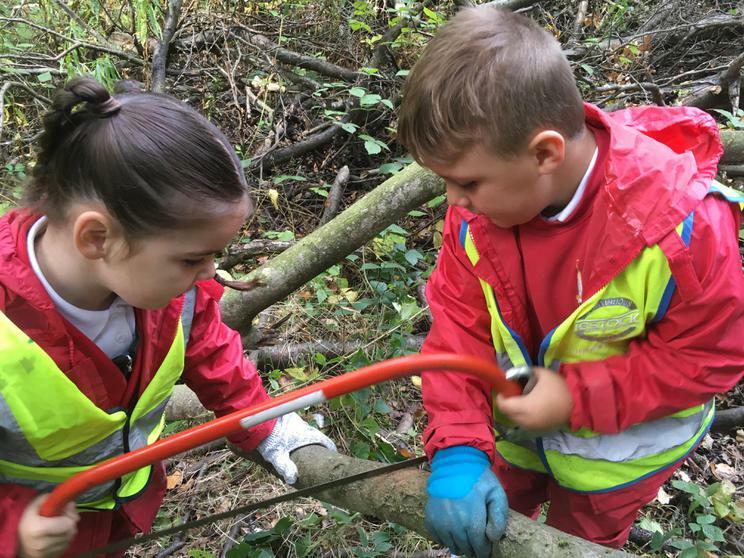 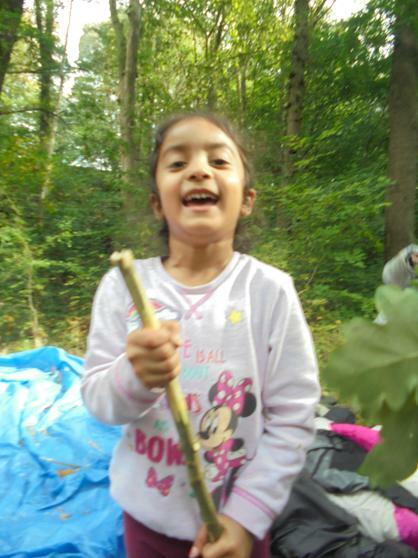 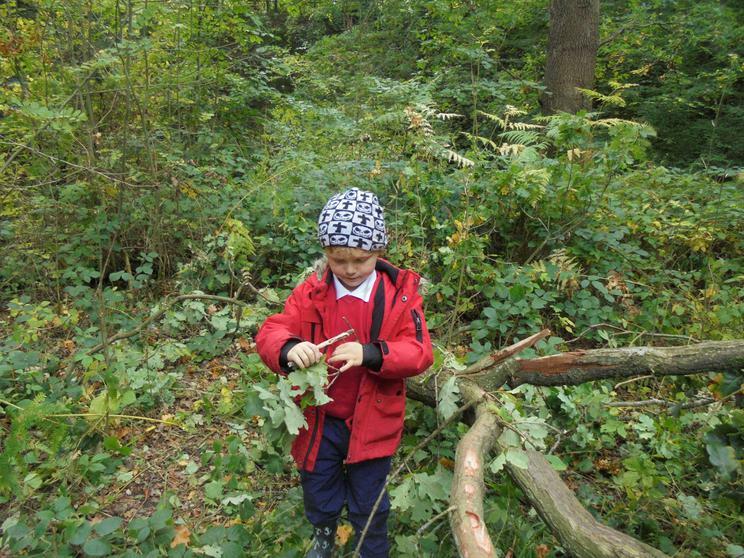 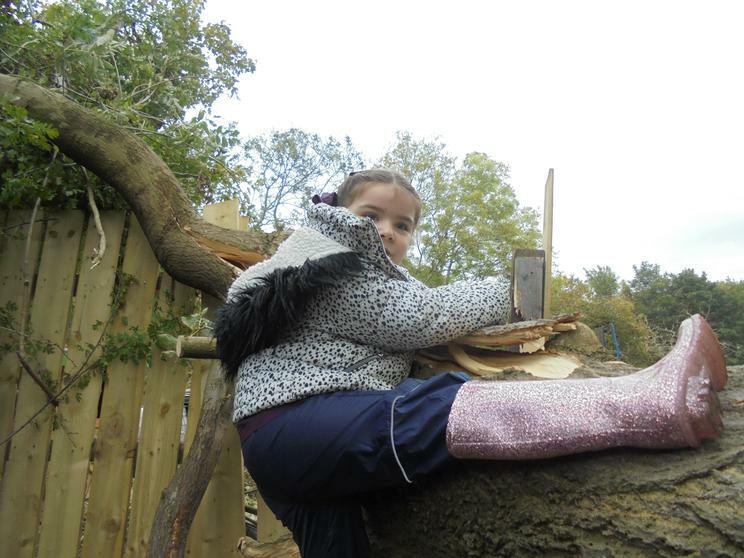 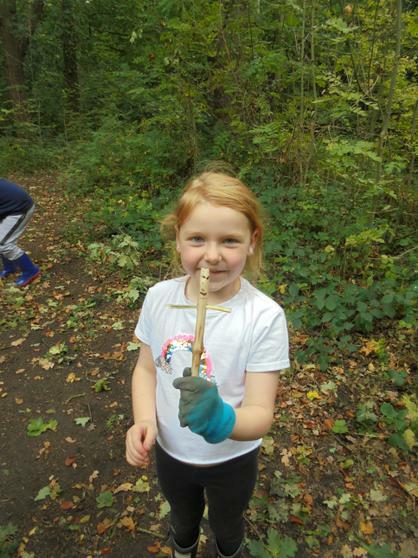 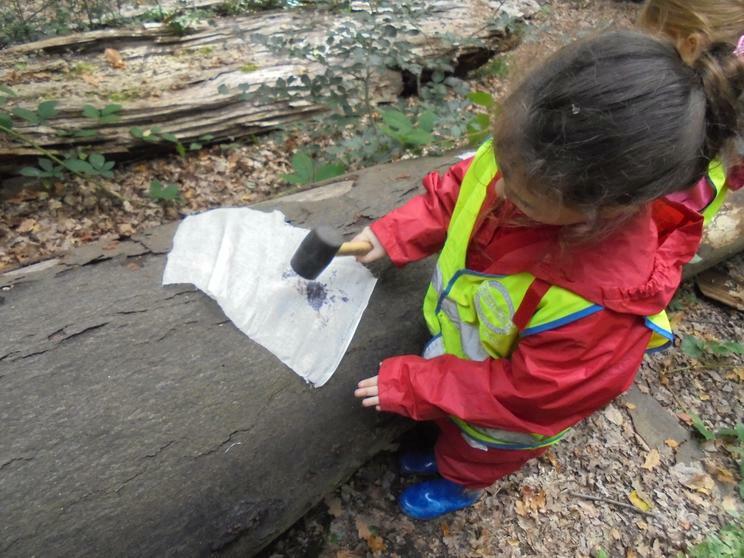 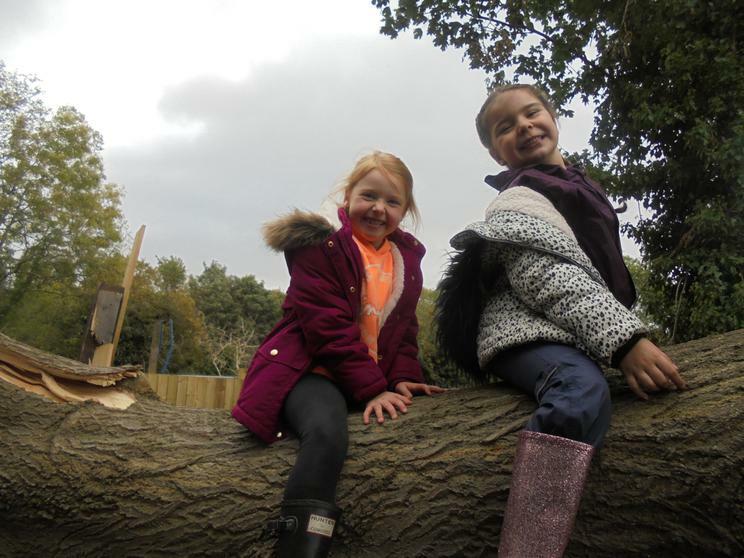 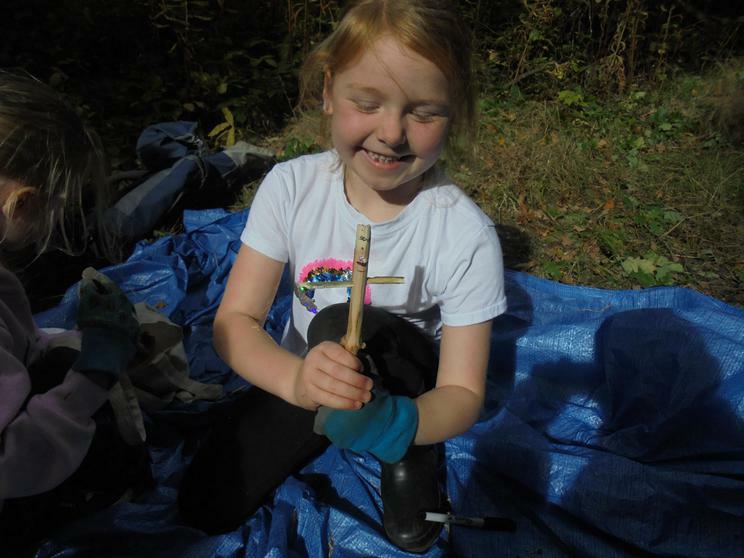 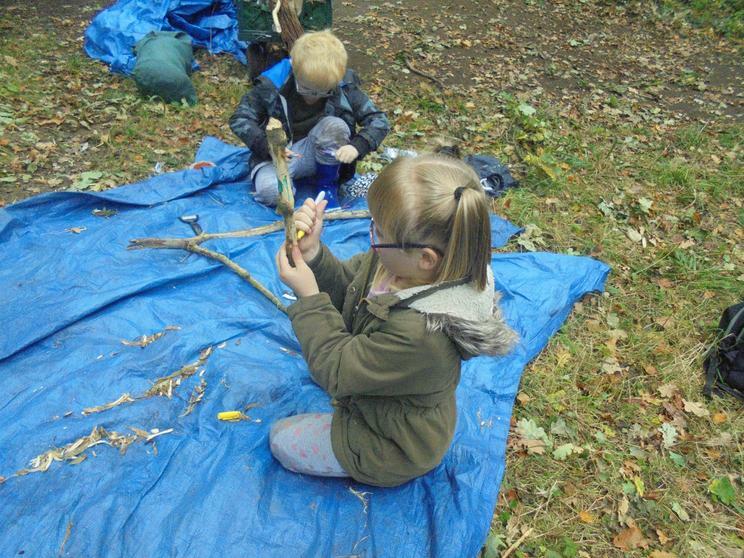 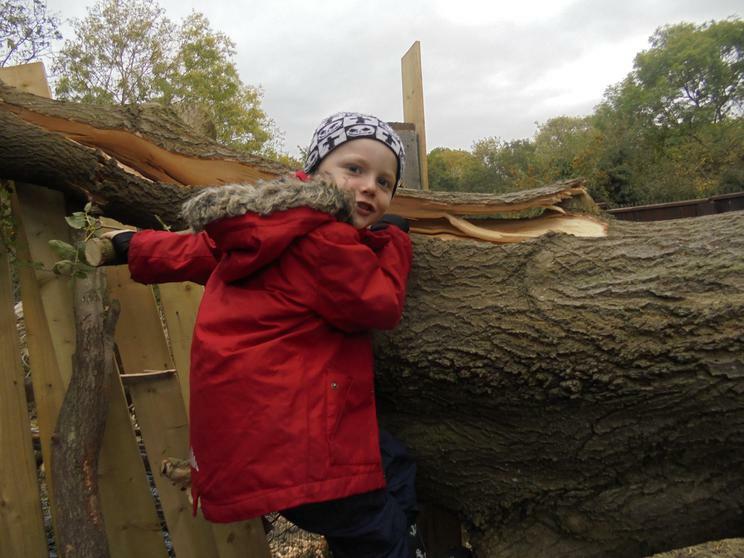 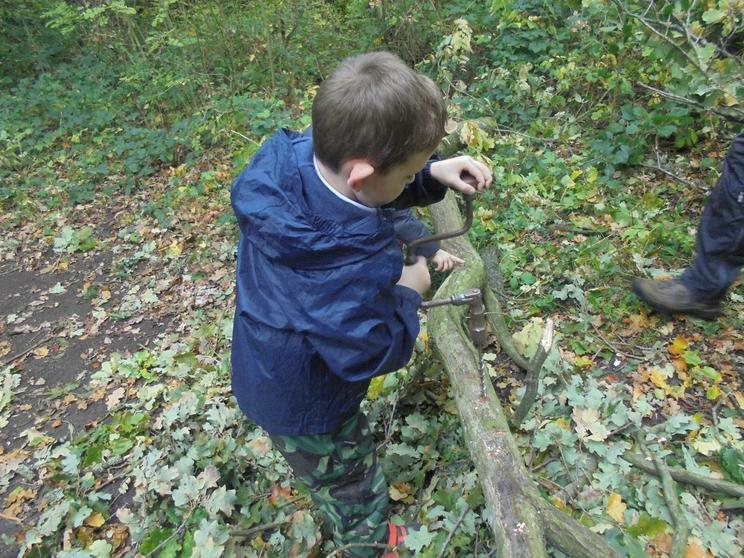 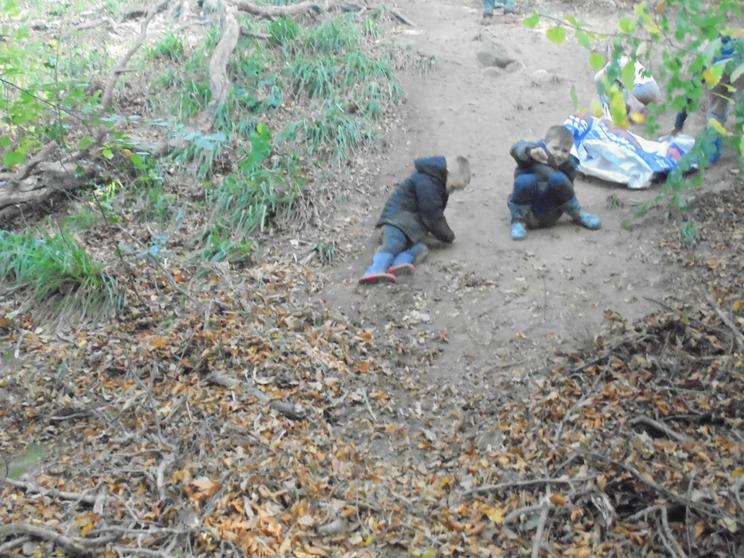 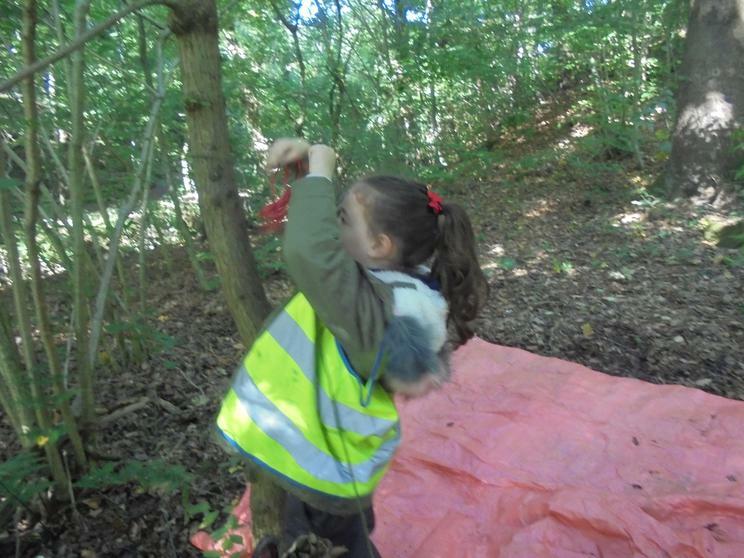 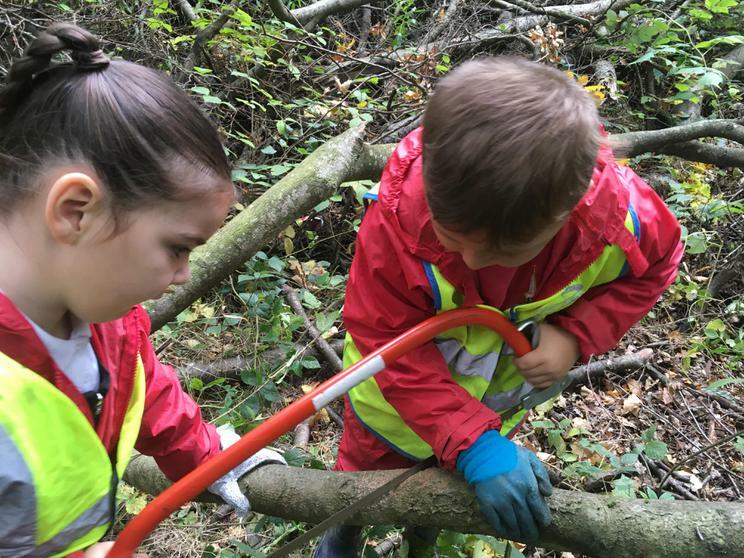 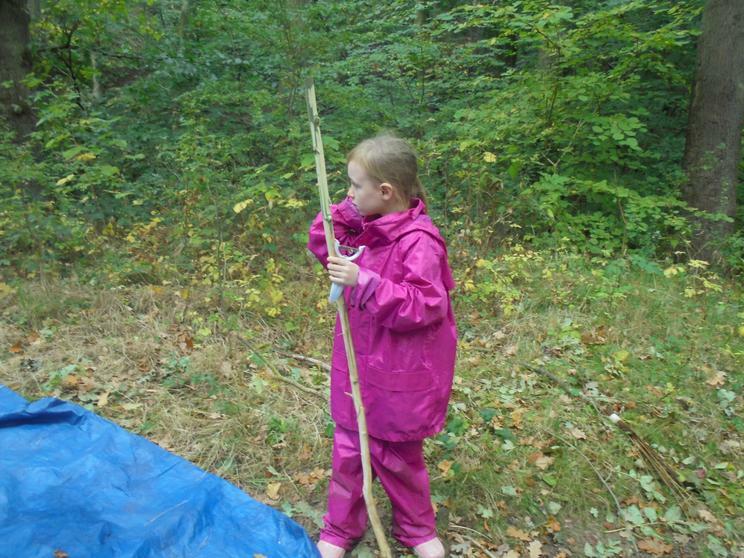 Other children were cutting wood to use in den constructing. 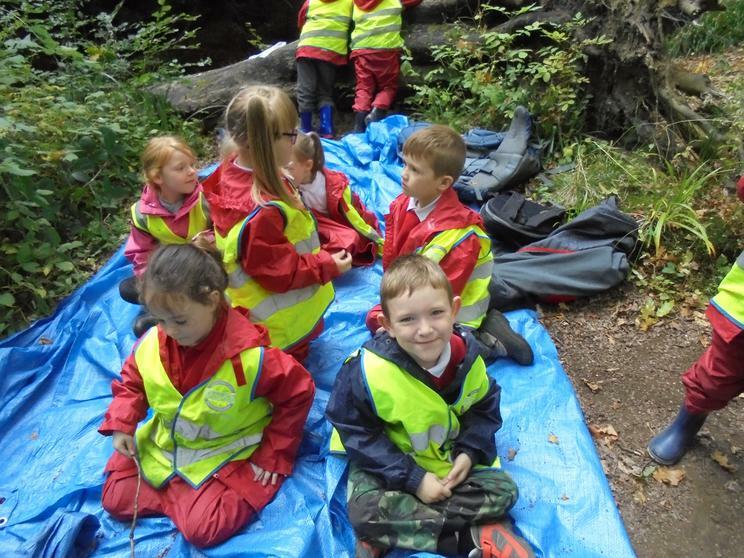 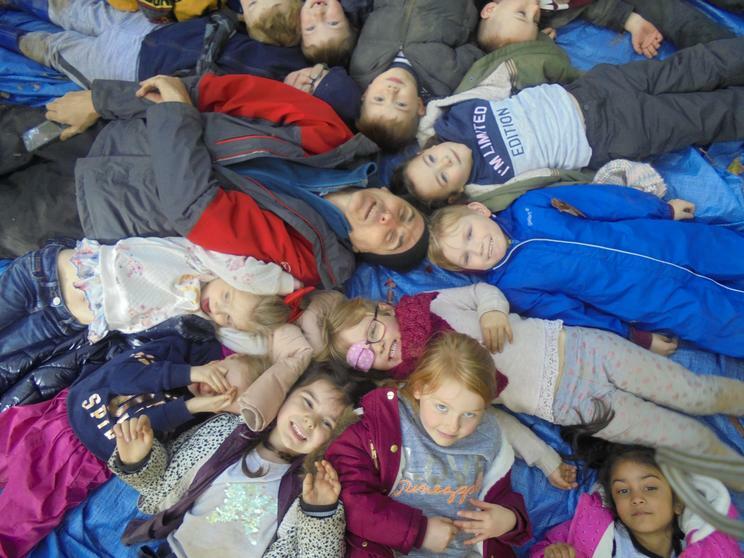 It was a very busy session, and from it the children got even more ideas of things that they would like to do. 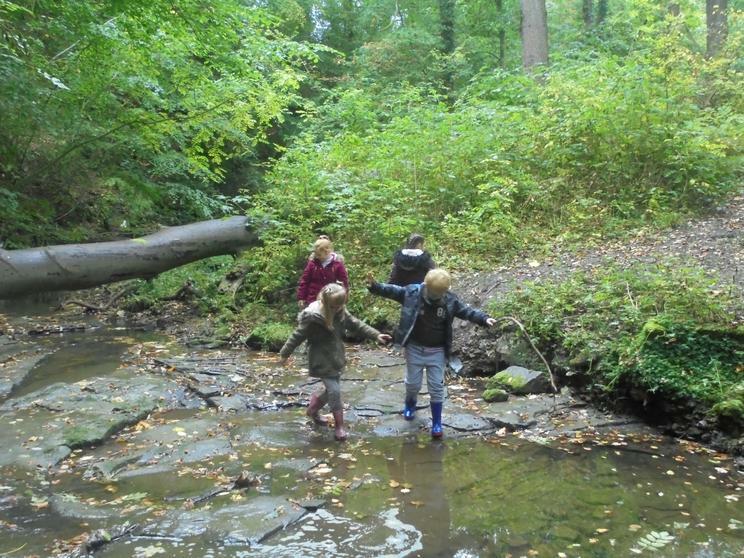 What a lovely walk down to the dene. 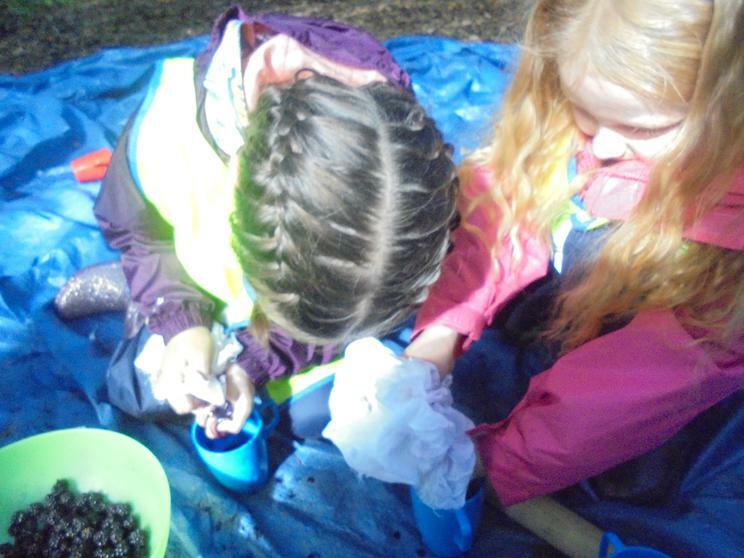 We found all sorts of different, interesting things including some 'Old Man's beard' (Clematis Vitalba), delicious blackberries and some hoof prints. 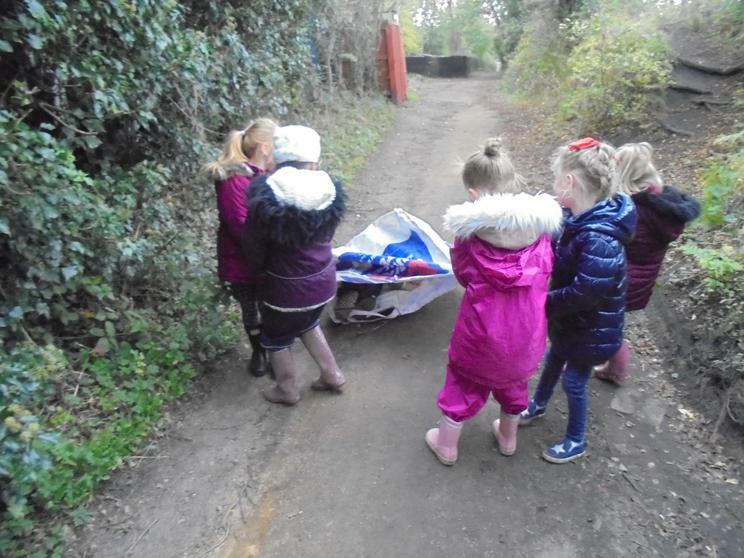 We picked what we could to use later and followed the hoof prints until we found a horse having new shoes put on. 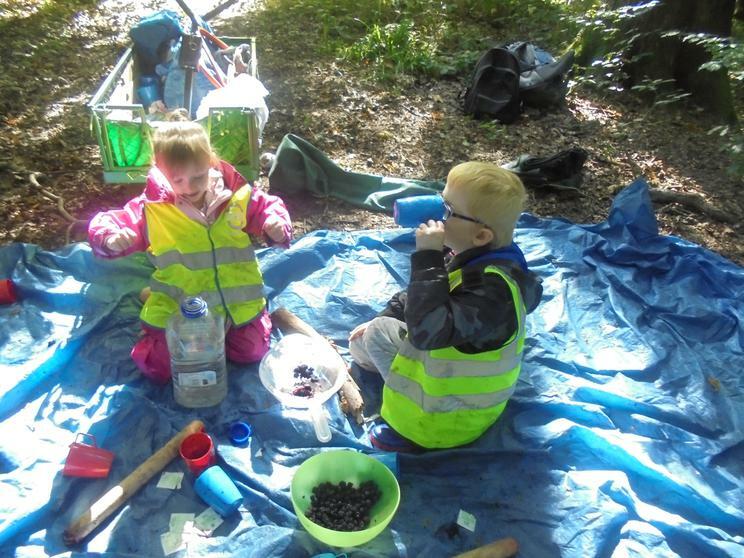 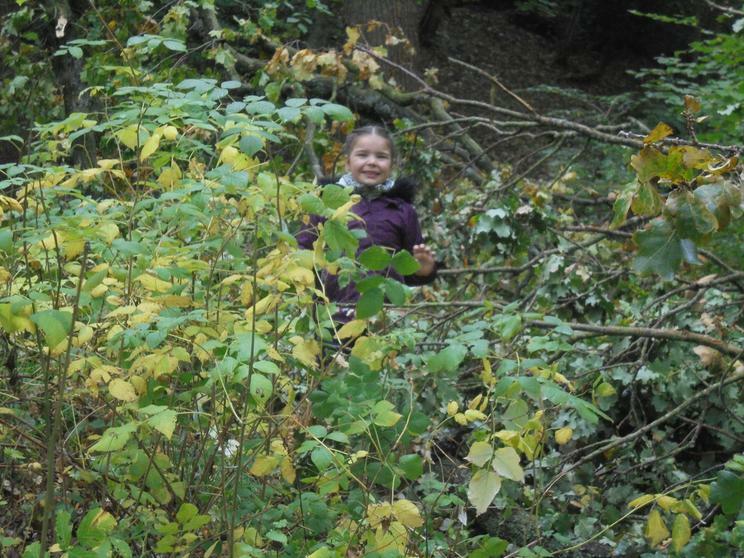 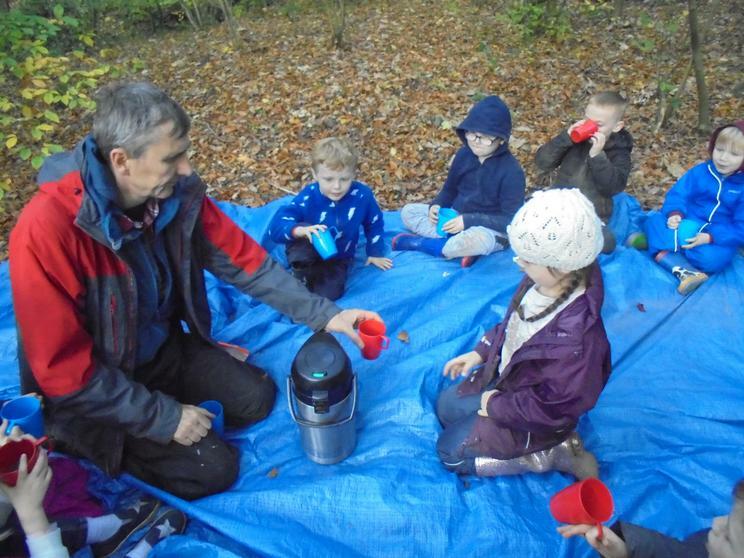 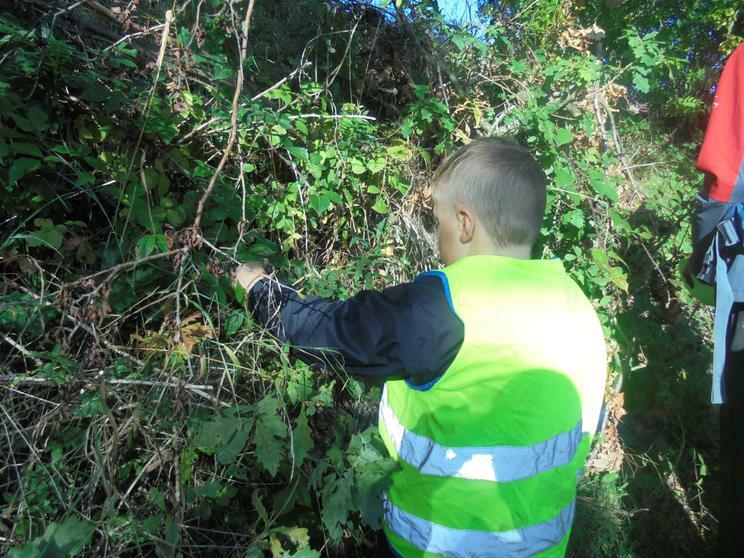 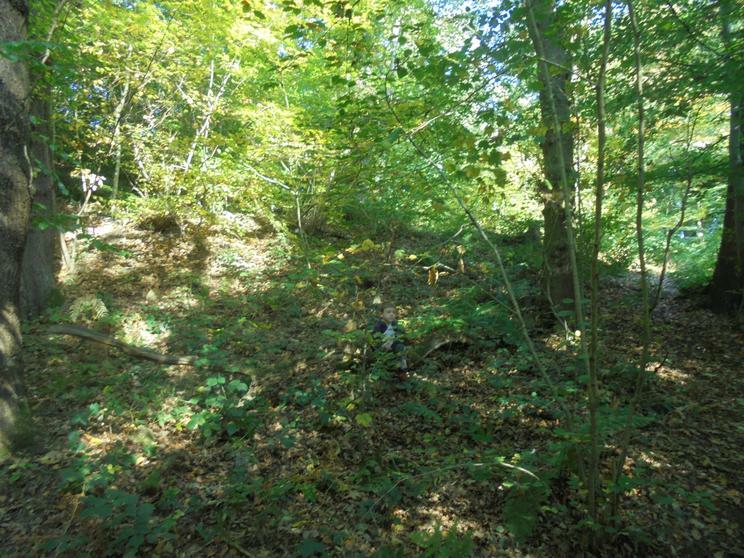 When we got to the dene some of us made dens while others turned the blackberries into some very tasty juice. 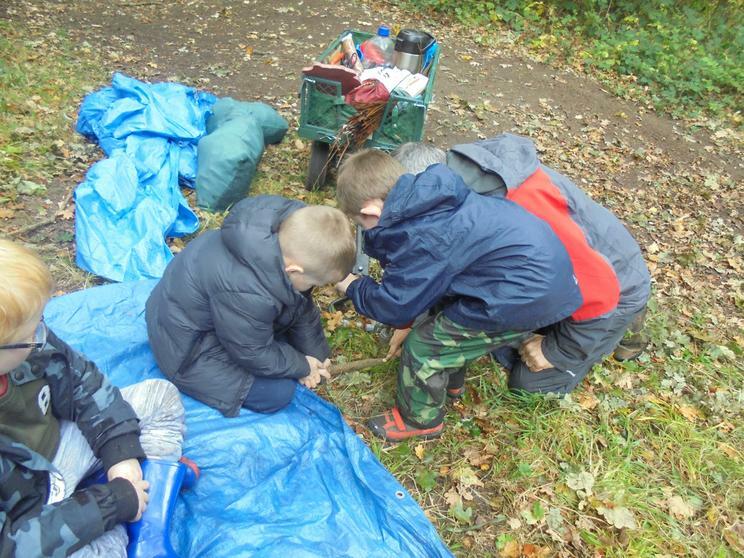 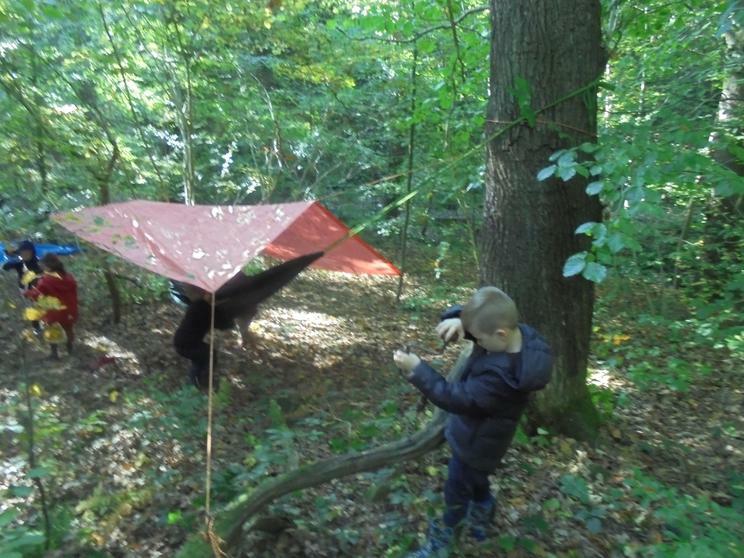 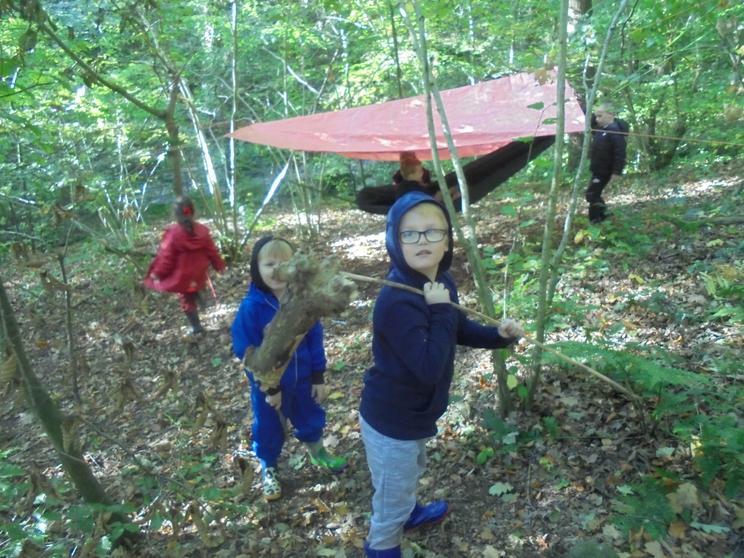 We started to look at how dens can be made and a few children had a go at using a bow saw to make some uprights to keep the tarp up. 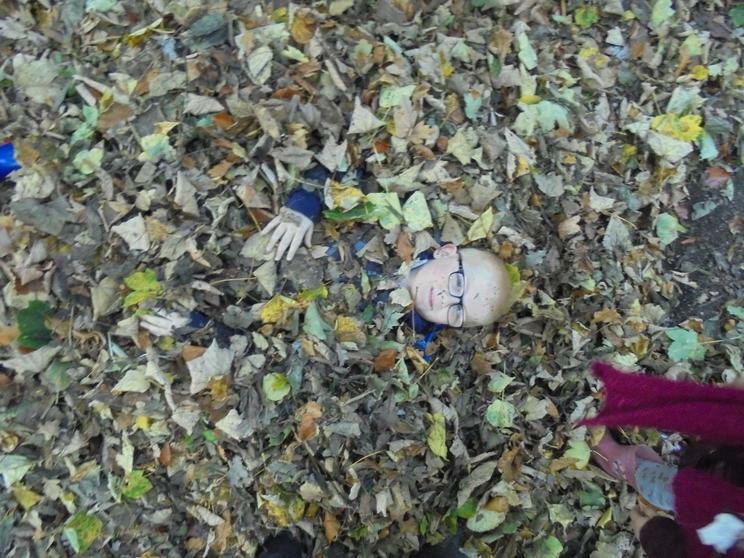 I think we might be doing some more work on that next week.